Another year has gone. For most, it is filled with many successes and challenges alike. For sure, many memories have been shared throughout the past 12 months. New Year’s Eve is a way to commemorate the year, to celebrate with loved ones, to reflect, and to wish for a prosperous new year. Family-centered: It was a tradition that the family stays together on New Year’s Eve. Whether with immediate or extended, our New Year’s Eve celebrations are traditionally centered around family. Having a Clean Home: We necessarily don’t like to keep a dirty home generally but for New Year’s it is imperative to do a more thorough clean of the home and start the new year fresh. Sweeping, mopping, decluttering and having fresh towels and linens. 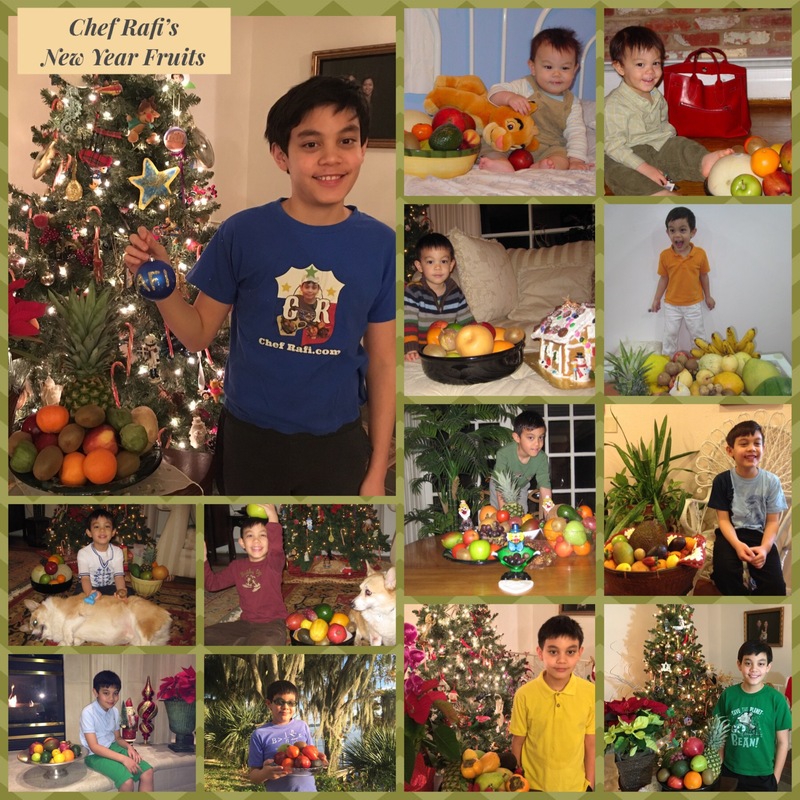 12 lucky round fruits: My mom emphasized the importance of displaying 12 fruits (especially round fruits) on our table. She explained to me that for New Year’s, the round shape is good luck and represents good wealth and fortune. The number 12 represents the 12 months of the year. Jingle coins in your pocket: During the last minute counting down to midnight, each person would jingle piggy banks or put coins in their pockets to jingle. When the clock strikes midnight, coins would be tossed to the ground for others to gather. Jump at the stroke of midnight to get taller: Another tradition at midnight is to jump as high as possible. It was said that jumping as high as we can help us grow taller. (Being that I’ve been 5 foot tall since I reached adolescence, I know jumping has not realistically been helping me grow, but we still continue this fun tradition to jump for joy at midnight. 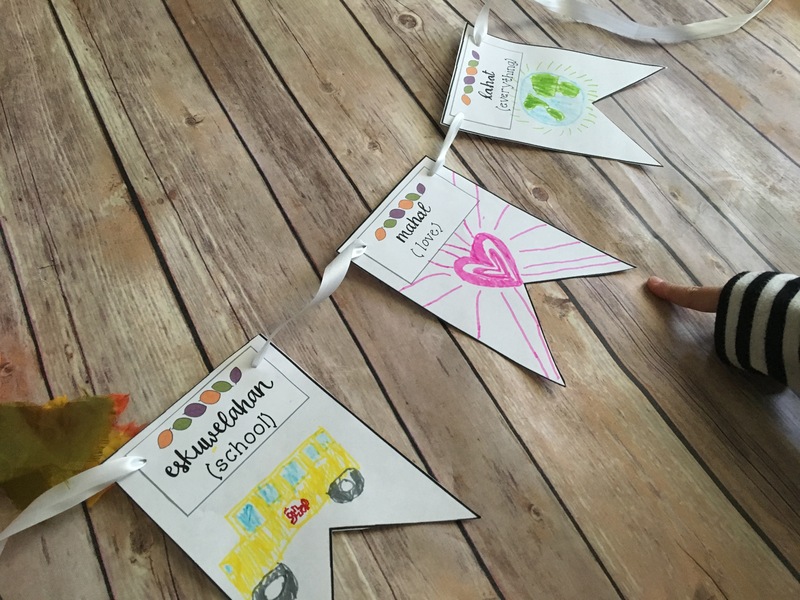 Noisemakers: With our voices as noisemakers, party horns, pots and spoons, and jingling piggy banks our family gets loud! We cheer for the new year and the family’s volume sure is contagious. Ginataang bilo bilo- a sweet coconut milk stew of sticky rice balls, jackfruit, sweet potatoes, and plantains). Arroz caldo- a gingery rice soup with chicken and hardboiled eggs. 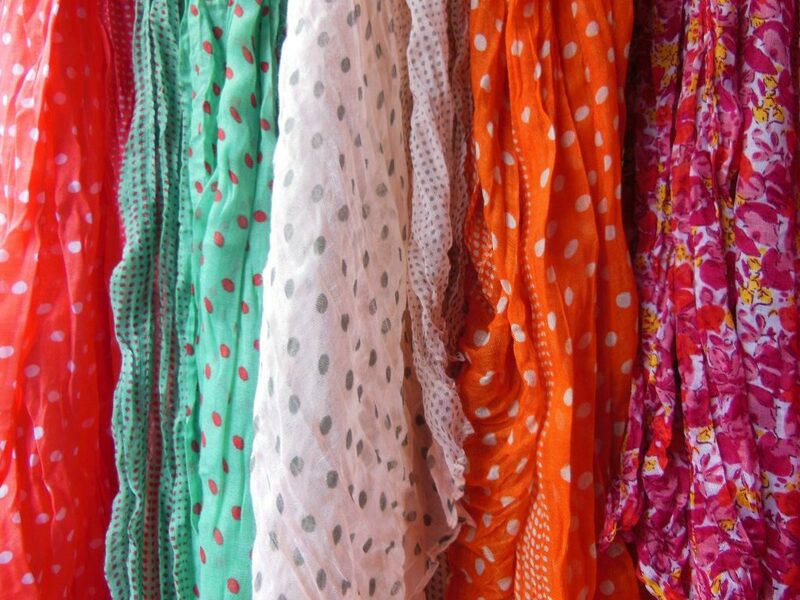 Wearing polka dots: As mentioned, circles mean good fortune, so with that, Filipinos will wear clothes with polka-dots to wish for prosperity in the new year. These traditions are some of the greatest memories I have with my family during this holiday. I hope to continue sharing many of them with our younger generations and to make new traditions as well. 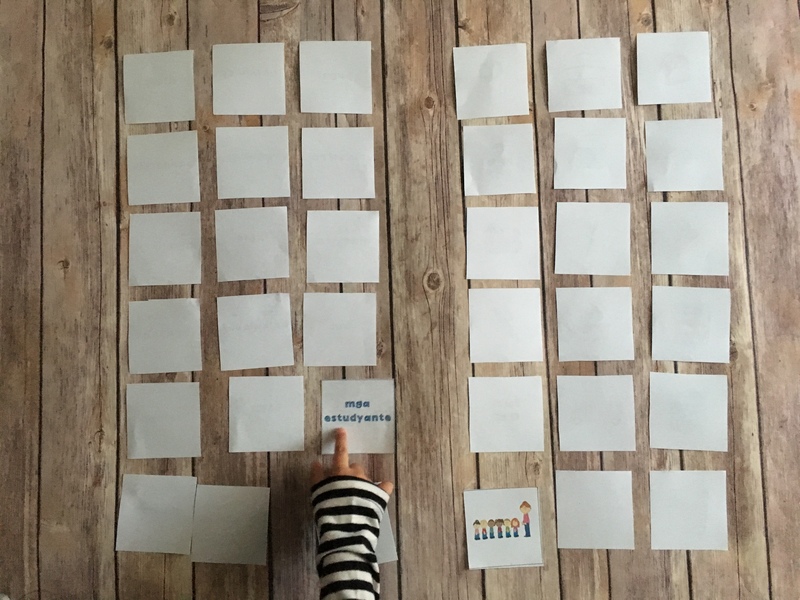 What does New Year’s Eve or New Year’s Day look like for your family? Feel free to share your traditions in our comment section or on social media. 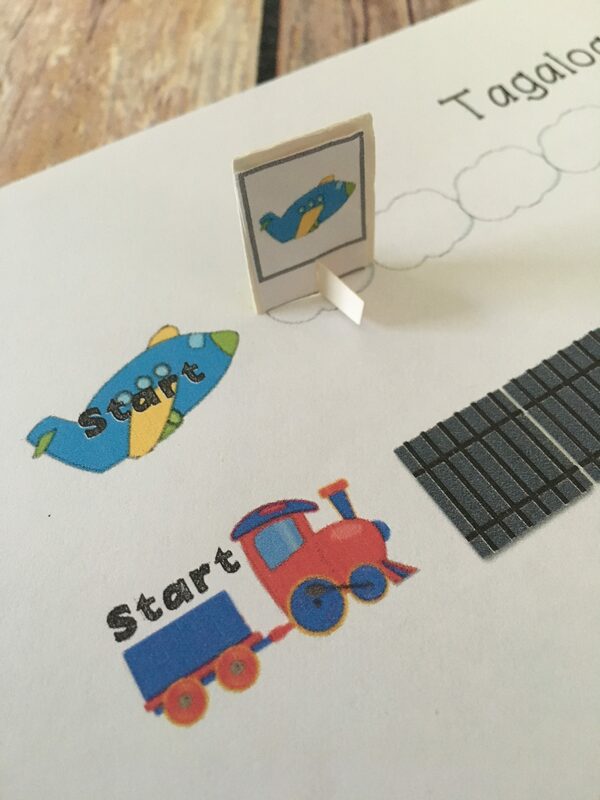 We have also created a printable activity for your child to do. 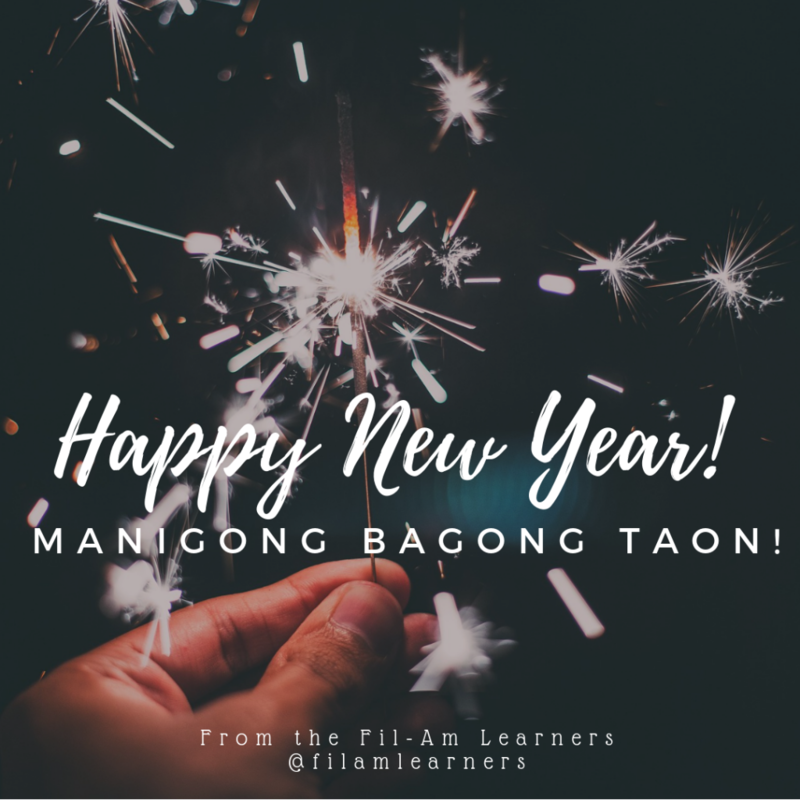 It teaches how to say Happy New Year in Tagalog and to practice writing it. It also includes a second page for your child to illustrate and color what New Year’s looks like for your family. 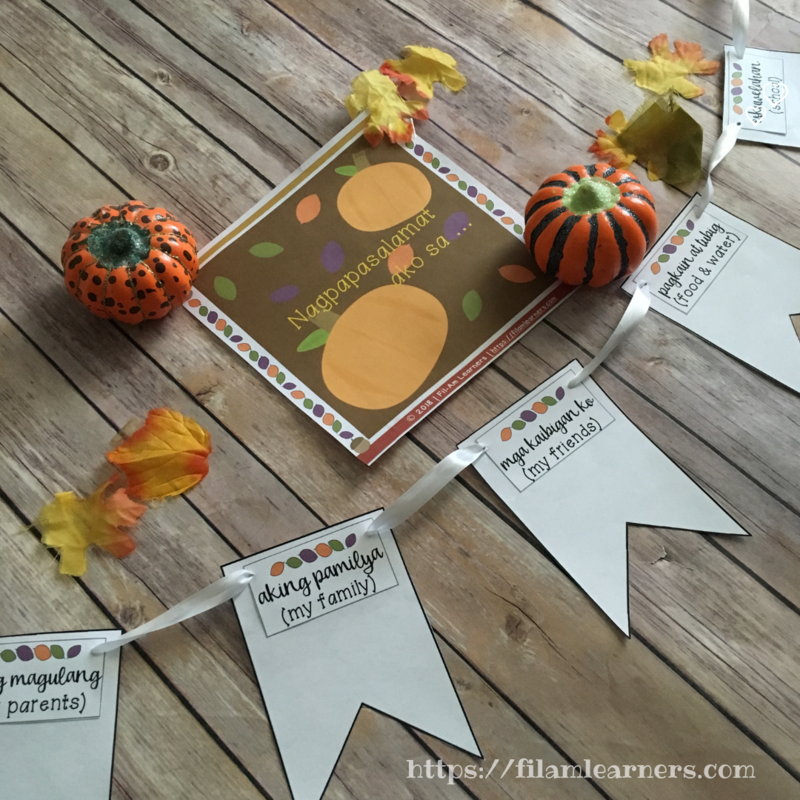 It is a great activity to have a discussion on your family’s traditions and also a wonderful keepsake to save for the future and look back on what the New Year’s celebration looked like through the eyes of your child/children during that year. The pages can be printed in the future years too if you want to date it and see the progression of the illustrations and memories. 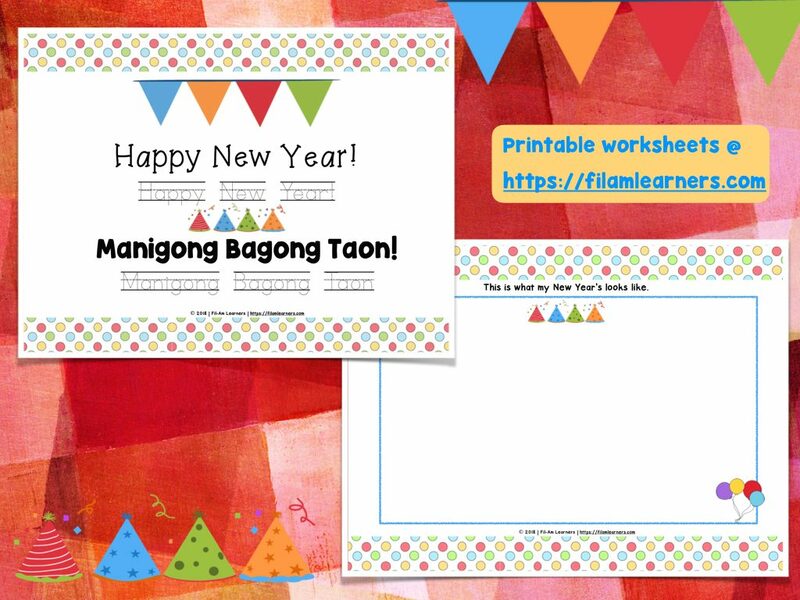 Get access to the Filipino New Year’s Tradition Activity printable here. Christmas in the Philippines is known to be one of the most festive and grand celebrations. 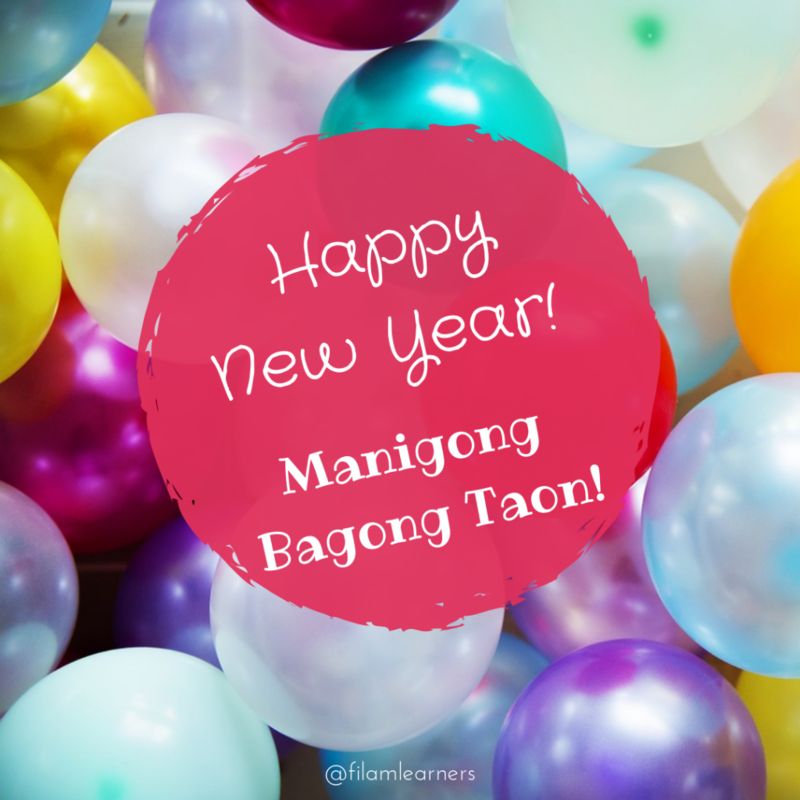 Between the assortment of delicious food, bright and colorful decorations, large family gatherings, and Simbang Gabi, Pasko (which is Tagalog for Christmas), is such a special celebration that carries on through the month and even longer. 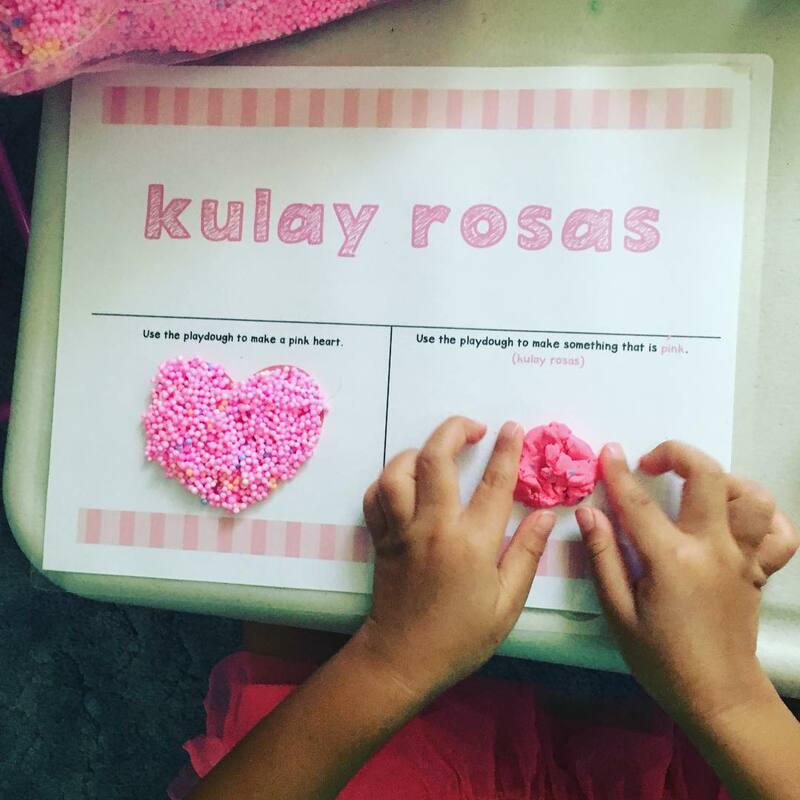 Filipinos all over the world celebrate this wondrous holiday in ways that both have commonalities and that also include traditions unique to each family. 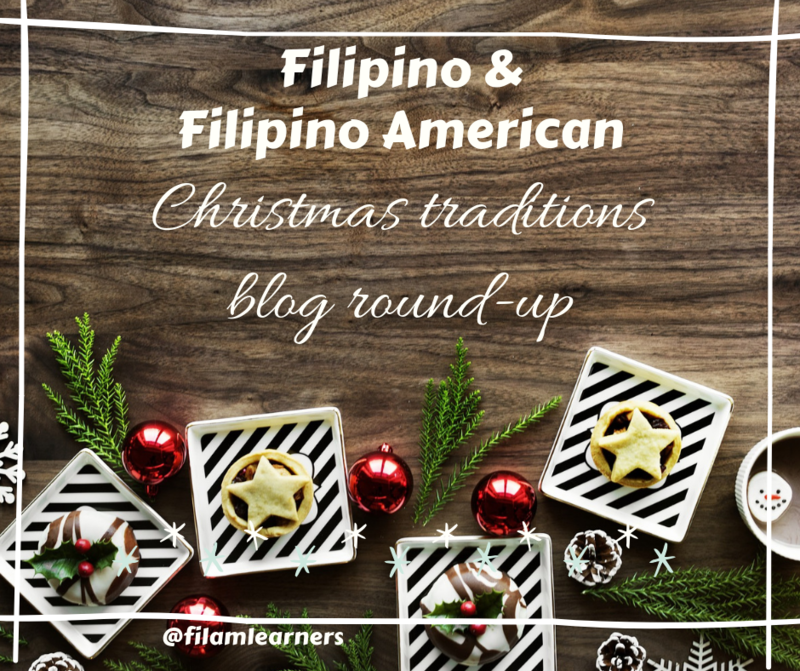 This post is a round-up of Filipinos and Filipino-Americans who each are taking a moment to share their special traditions. 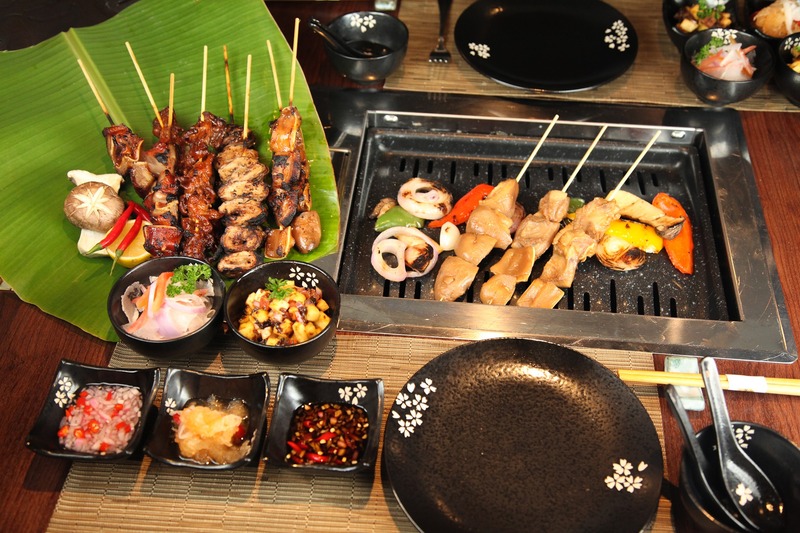 There’s nothing like the feeling of togetherness food can bring to family and friends. Whether preparing it together or sharing a meal together, food can bring special memories for holiday traditions. 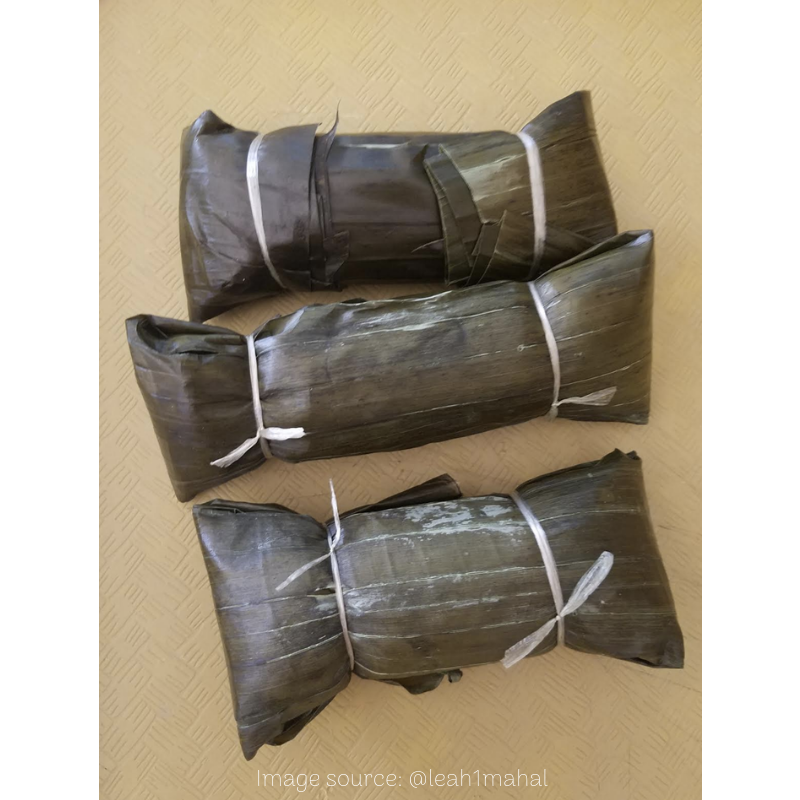 Ria Pretekin of Urban Ohana recounts her interfaith family’s celebrations of Christmas and Hanukkah in her post, “Latkes and Lumpia.” Much of their tradition is decorating the tree with Filipino decorations including mini parols, attending Christmas mass, and taking pictures with Santa. Are you or your kids into those surprise balls? 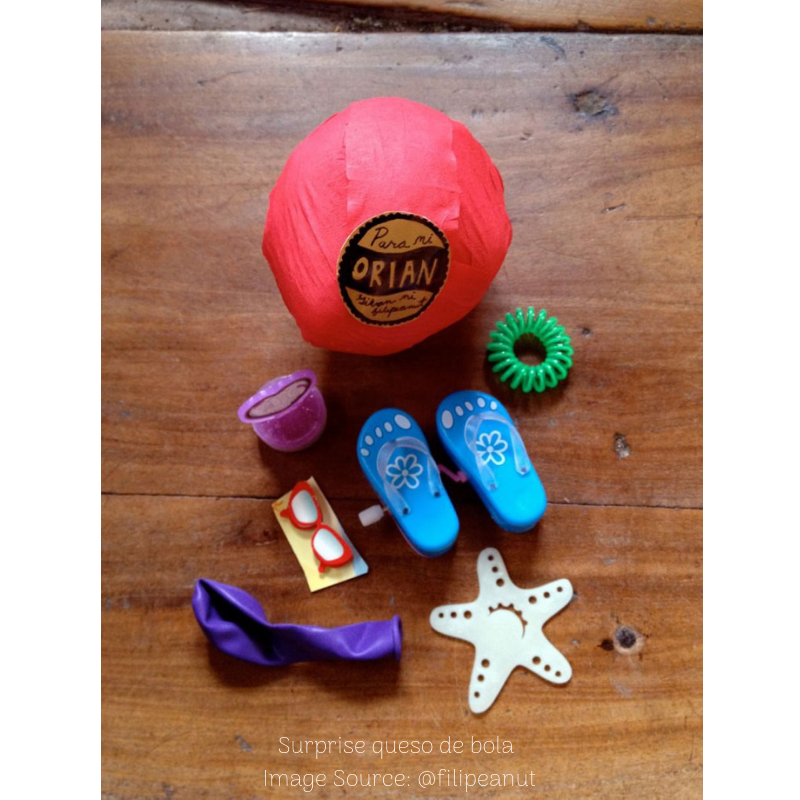 This Surprise queso de bola activity (created by Albert @Filipeanut) is the perfect blend of the widely-known surprise ball with a Filipino twist. It is a Filipino Christmas tradition to serve queso de bola (ball of cheese) during Noche Buena. 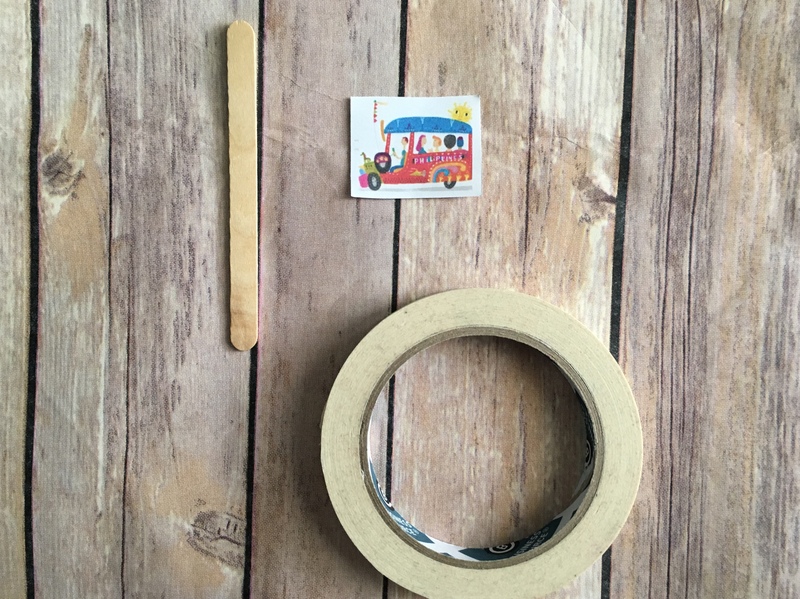 Learn how to make this fun craft here. Maligayang Pasko! 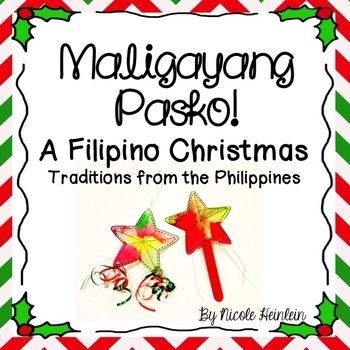 A Filipino Christmas unit: If you have children from Kindergarten through third grade, this printable unit on Filipino Christmas (from Teachers Pay Teachers) might be for you. 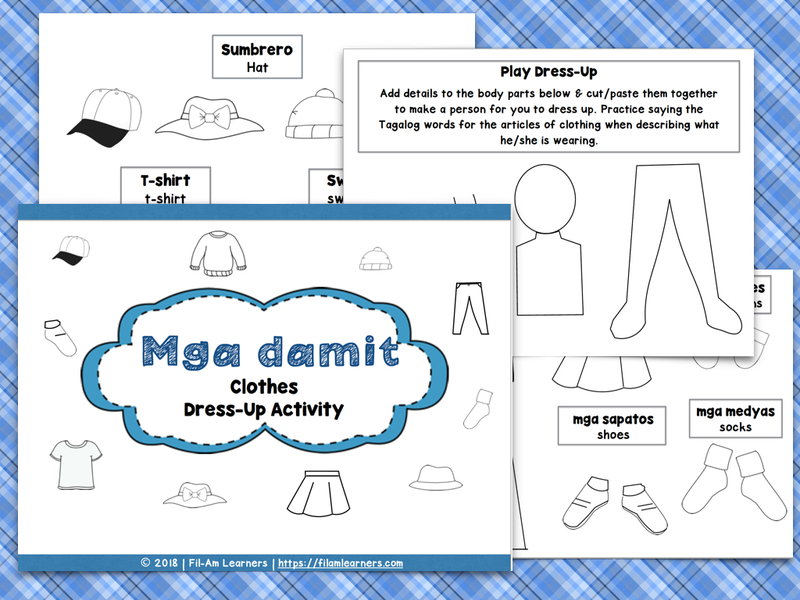 It includes writing activities, a booklist, vocabulary cards, a mini-booklet, a parol craft, and more. Last, but certainly not least, we must talk about the parol when we bring up Filipino Christmas traditions! The parol is a brightly colored star-shaped lantern that is displayed magnificently lighting up our homes and streets during the holiday season. When seen, the parol symbolizes Christmas at its best. 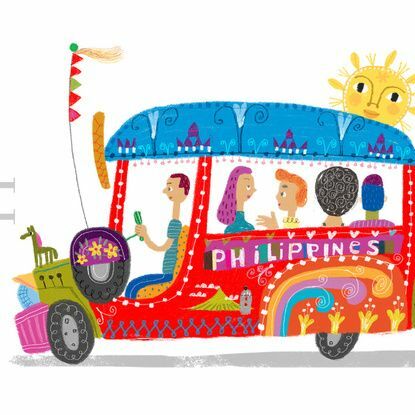 Timpla illustrates the beauty and symbolism of the Filipino parol in this post. 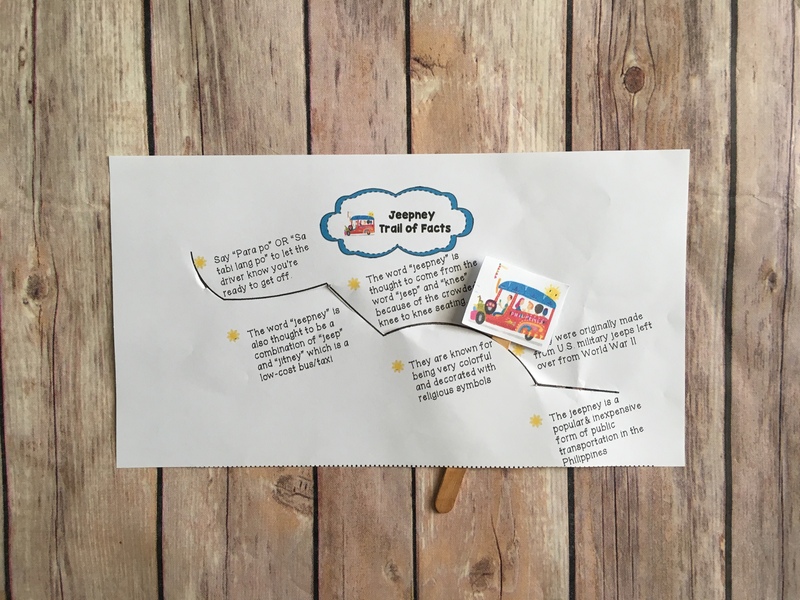 In honor of Christmas and sharing all of these wonderful traditions, we have created a printable craft for you and your child to make. 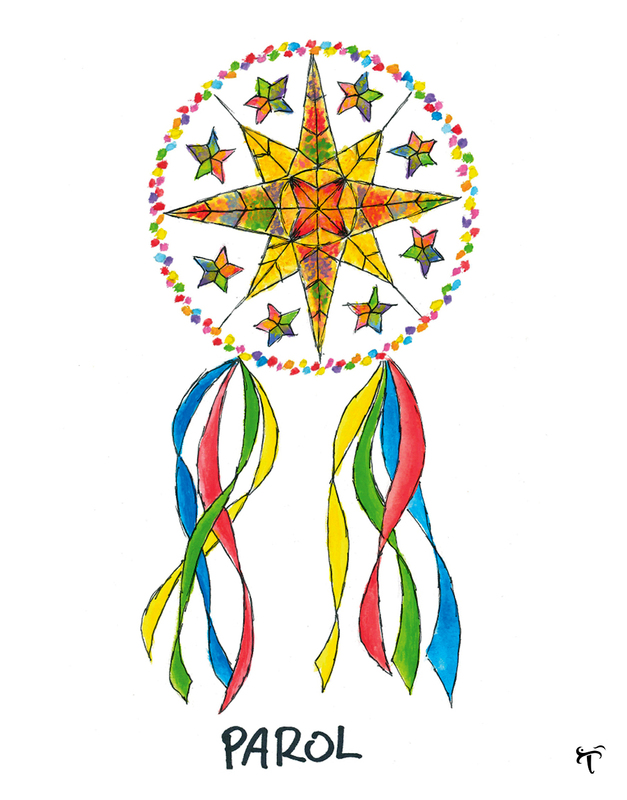 It is a mini parol to draw and write some of your favorite Christmas traditions on. 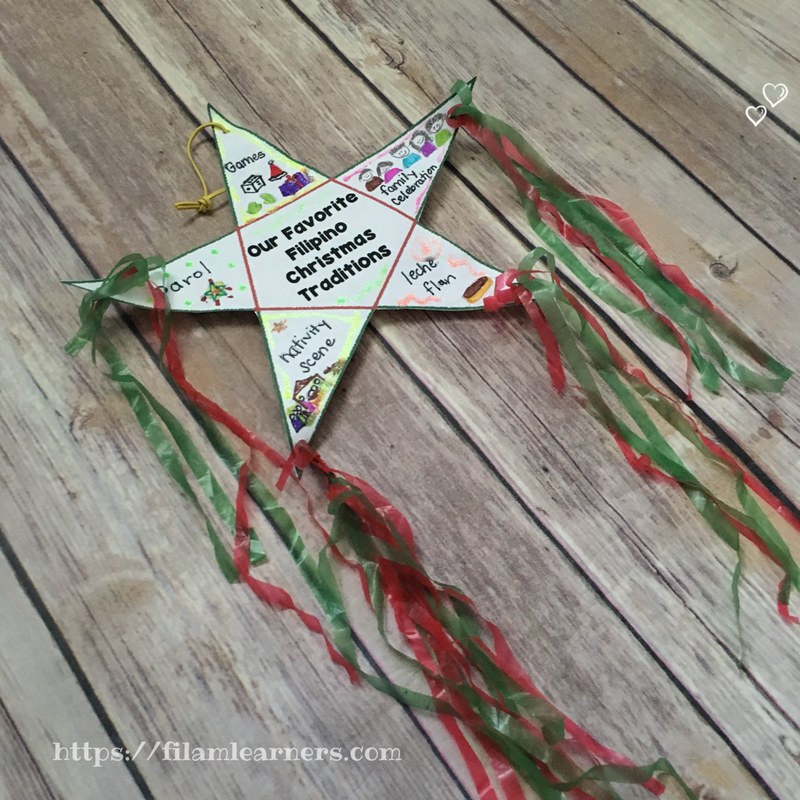 The parol can be decorated and hung as a reminder of the special traditions, whether it be food, activities, games, songs, places that you share with your loved ones on Christmas. Get your printable parol here. So let’s hear from you. 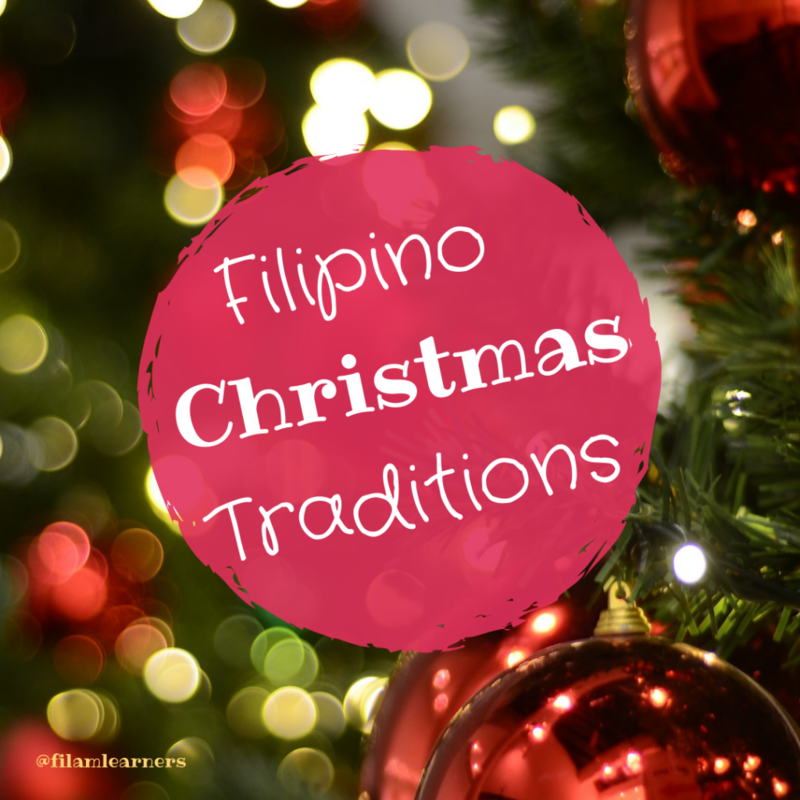 What are your favorite Filipino Christmas traditions? Comment below to share. Our community loves to hear and share cultural stories with each other. Do you know someone who loves to read? 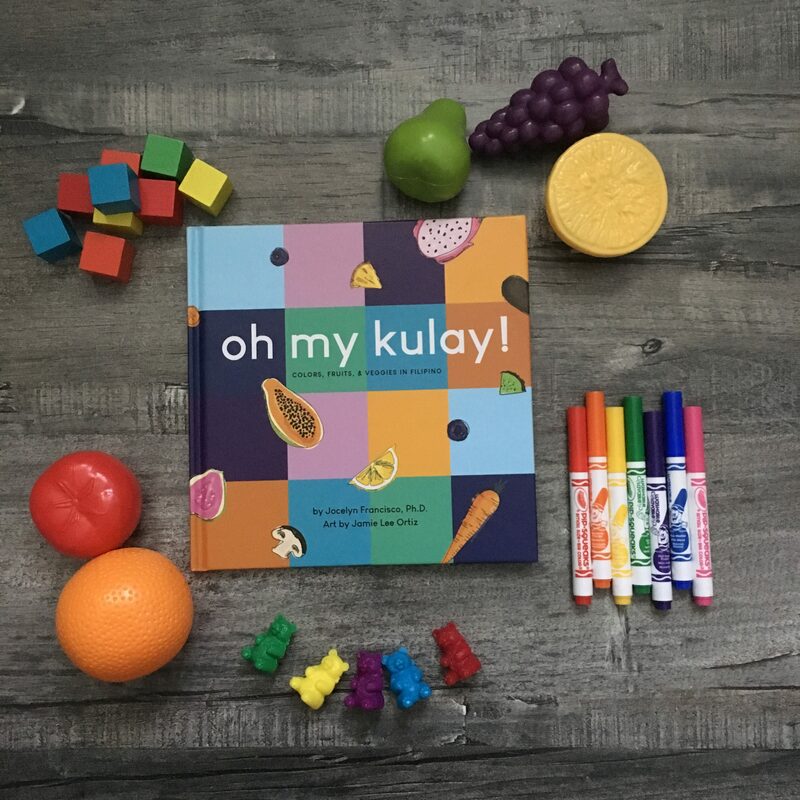 These books make great reads for this holiday season and teaches so much more about Filipino heritage and their many celebrations. Shopping for someone with style? 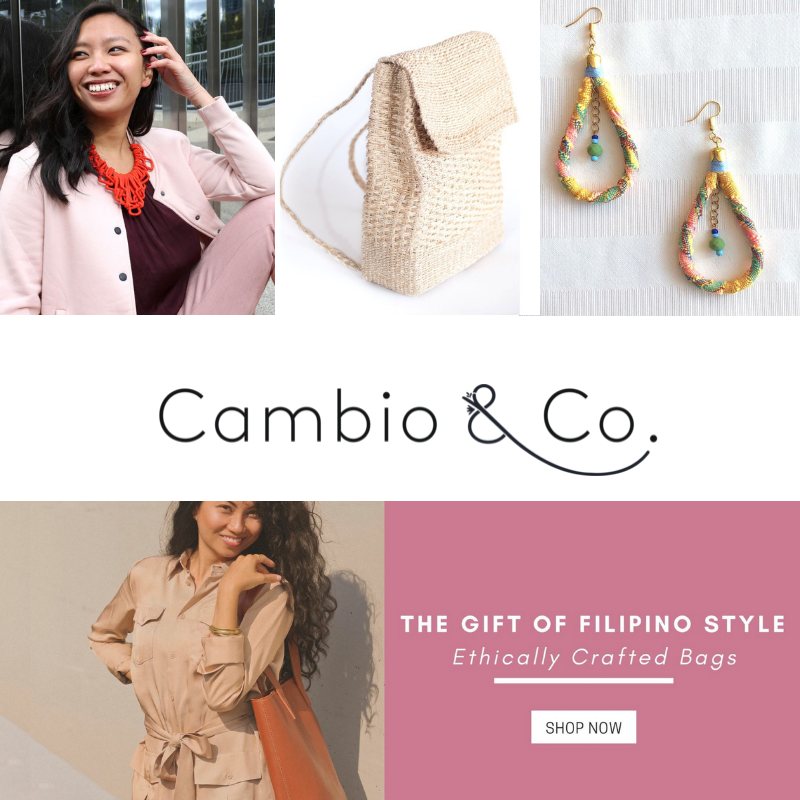 Get exquisite handcrafted products made by Filipino artisans at Cambio & Co.
We have created a craft activity for you and/or your child to make a beautiful gratitude banner. 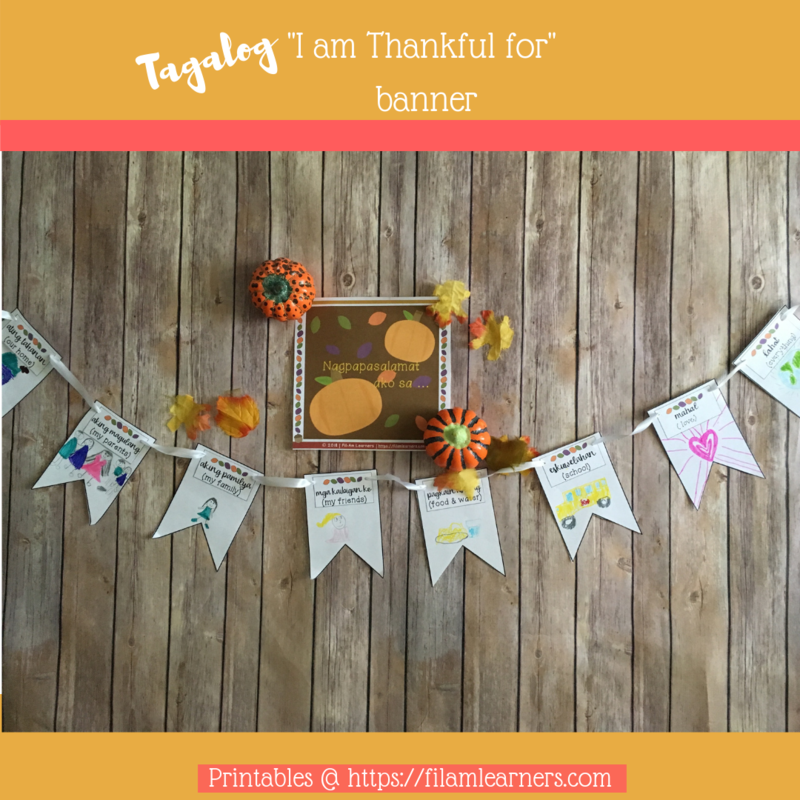 It can be hung this month (or any time of the year) as a visual reminder of all of the wonderful things you are thankful for. 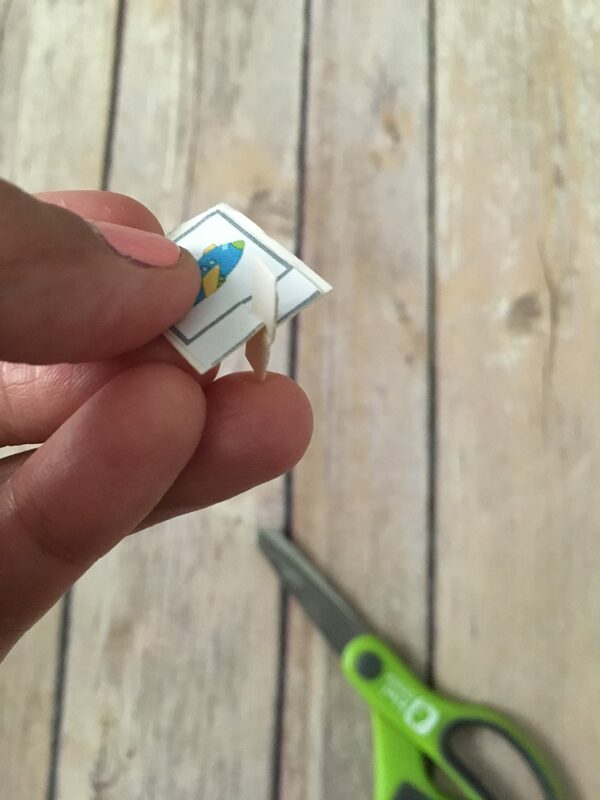 The printable templates and labels for the banner are FREE and are available in our “Shop”. 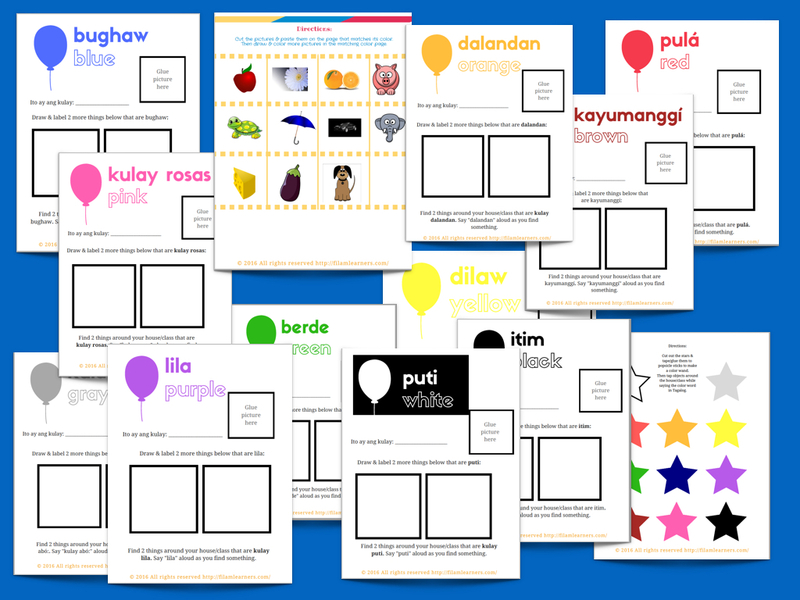 Once you download and print them out, pictures can be pasted on or drawings may be illustrated and colored to go with each Tagalog/English label. 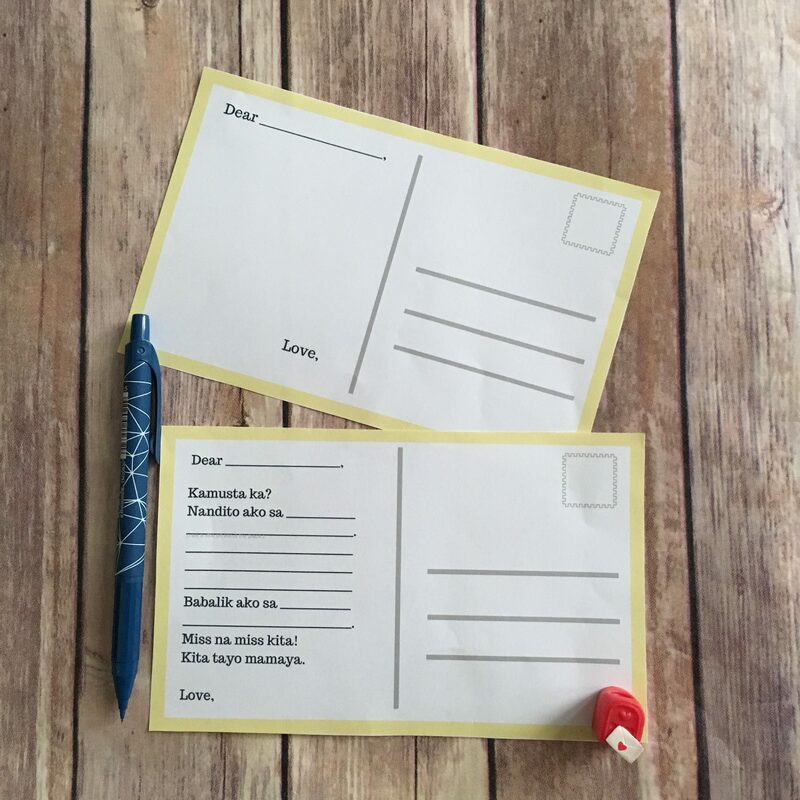 Blank labels are also included for you to customize and fill in your own response of what you are thankful for. 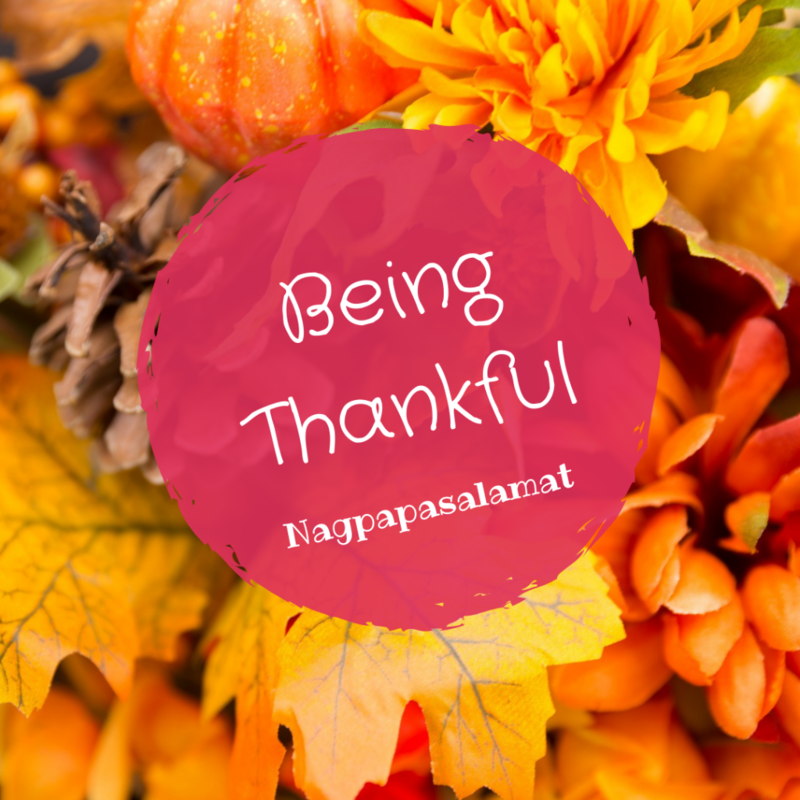 Head over here to get access to your Tagalog Thankful (Nagpapasalamat) banner. It’s October! That means it’s time to celebrate Filipino American month. 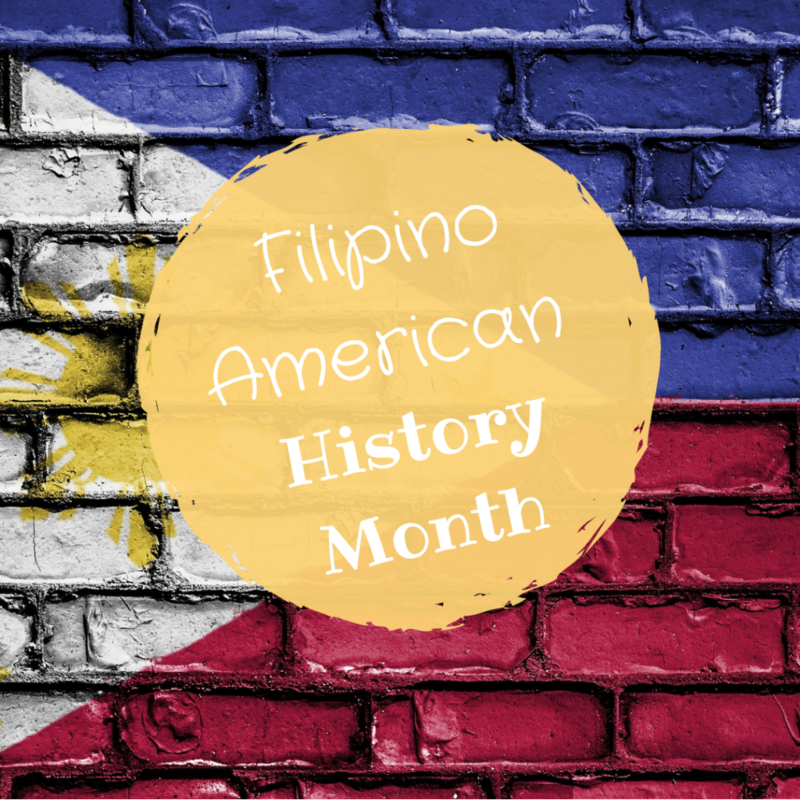 There is so much to be told and shared from the history of Filipino Americans. When did Filipino first migrate to the United States? How were their lives like? How did they establish themselves in this country? The Filipino American story, that is not published and shared enough in history books, in our country, is out there to be uncovered by more people and passed along so that our current and future generations can see the hardship and beauty of this culture. 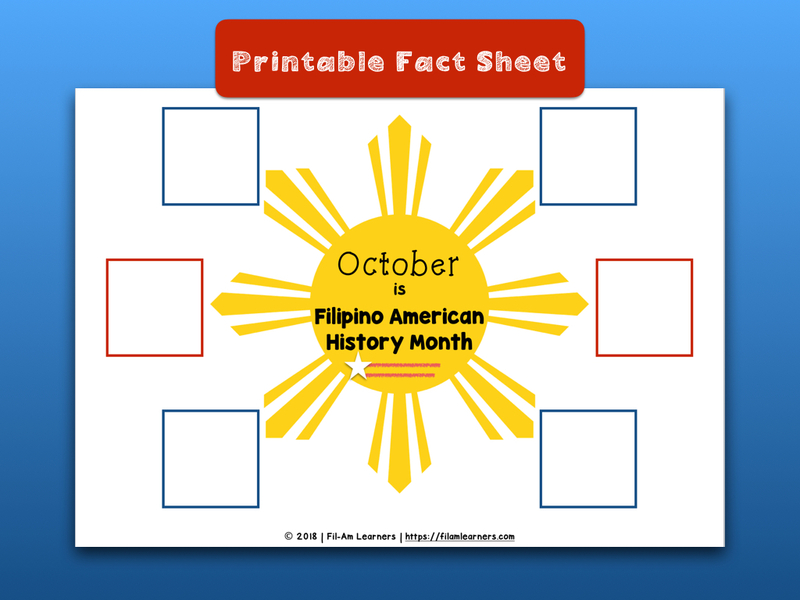 This month we will be sharing resources and facts from Filipino American history. Keep reading on to find a list of resources. 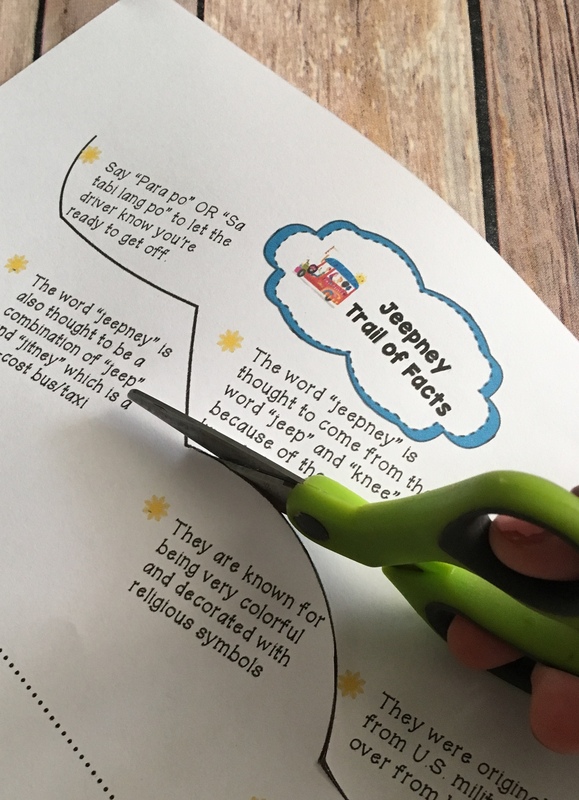 While learning more about the history of our culture, we have created a printable fact sheet graphic organizer for you or your kids to fill in some facts that resonated with you. 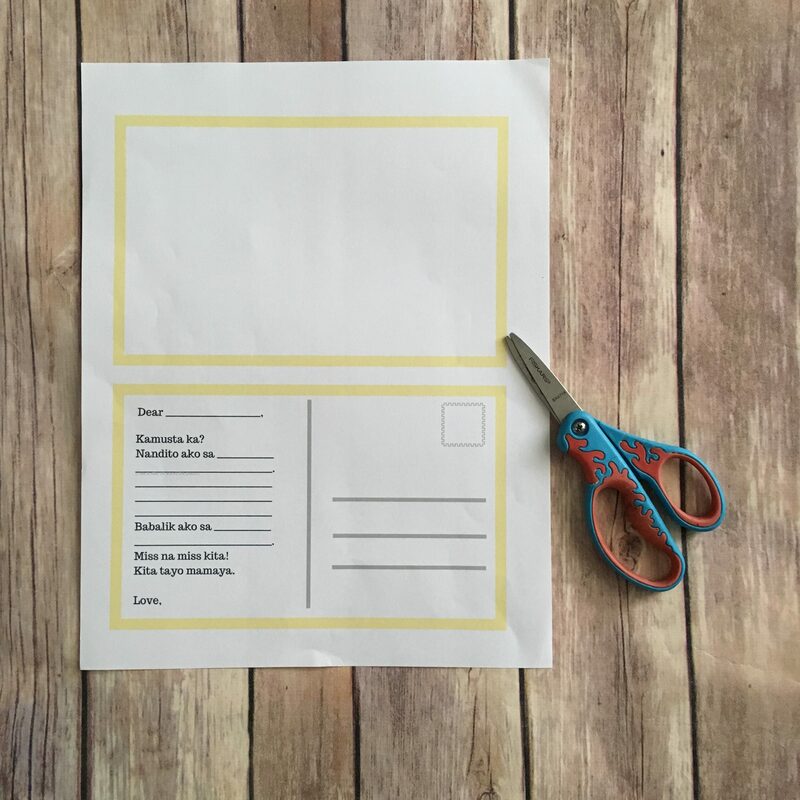 Head over here to get access to this printable. FAHNS (Filipino American History National Society) – A national organization, founded by Dr. Dorothy and Dr. Fred Cordova in 1982 with a mission to preserve and document Filipino American history. 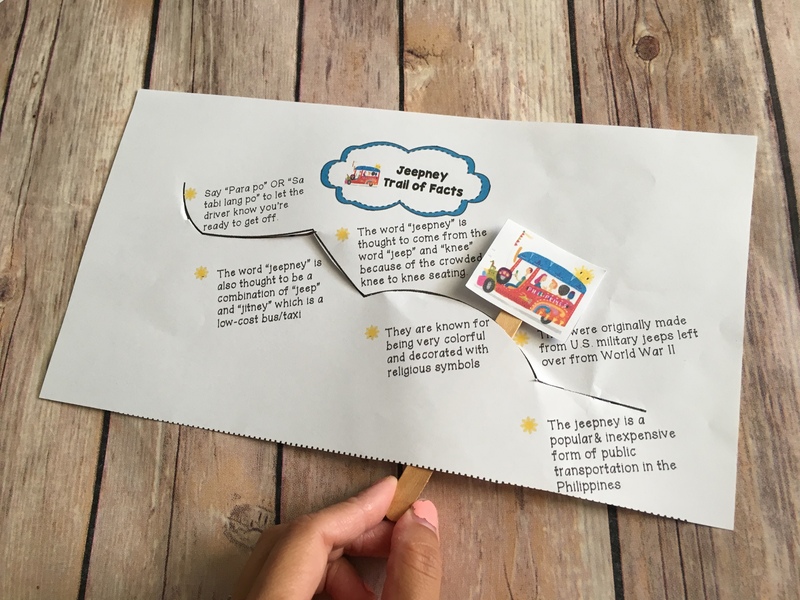 Their site is filled with extensive resources, a gallery, information about the museum, events, educational activities, and more. Filipino American History Month Celebration at San Francisco City Hall Rotunda: October 19, 2018 @ 5:00-7:30 (Details here). 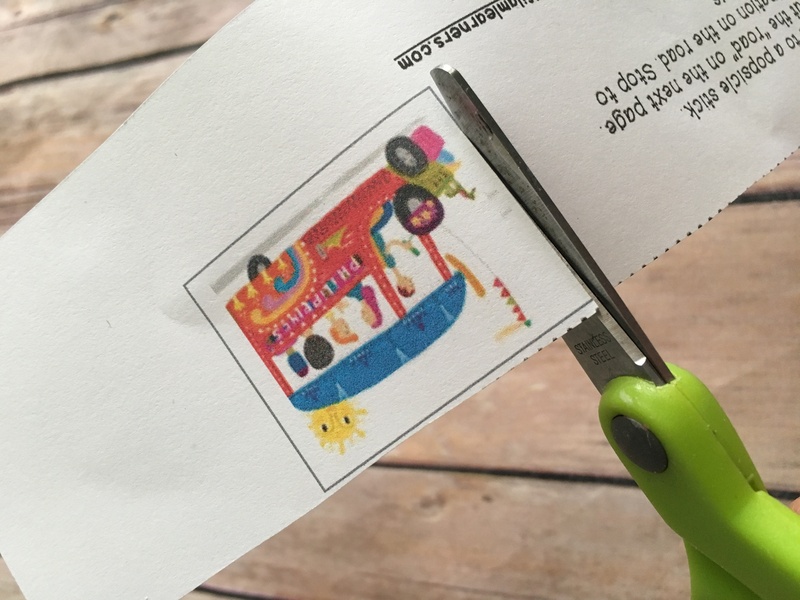 Can’t attend these events? Here are 9 Ways to Celebrate Filipino American History Month (by Halo-Halo, Mix-Mix). Salamat Po! was written by Adriana Allen, a mother who wanted to teach her Filipino American children about the Filipino culture, but couldn’t find many books on it, so she decided to write her own book to share. 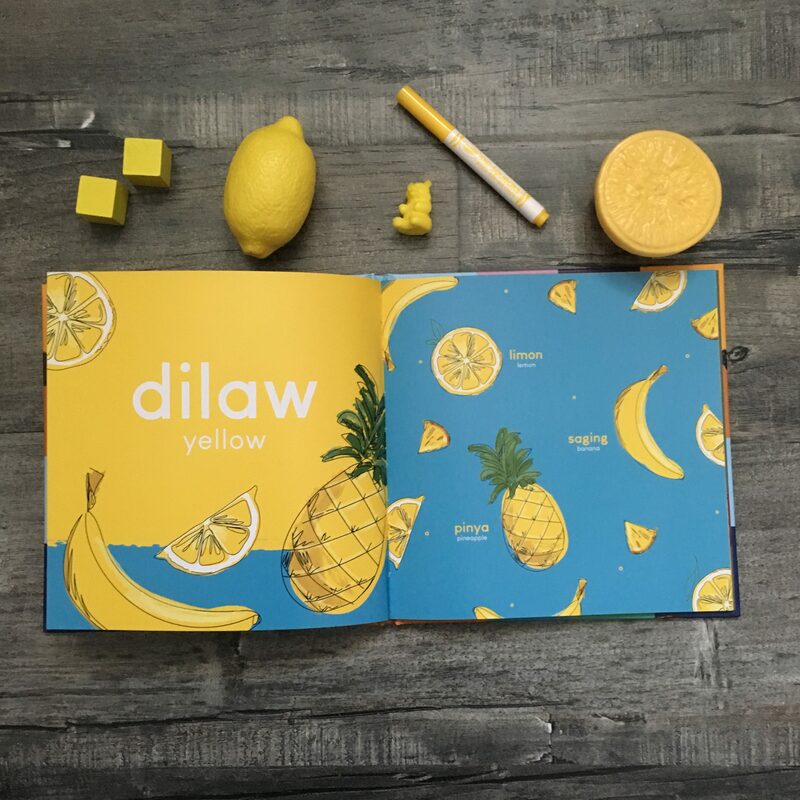 It is an adorable picture book teaching children how to show respect in the Filipino culture, which is a very important value. (To learn more about showing respect in the Filipino culture, see related post here). America is in the Heart by Carlos Bulosan, tells the story of growing up in the Philippines, migrating to America, and the struggles as a first-generation Filipino-American. In The Filipino-American Kitchen, chef, teacher, and author, Jennifer Aranas shares over 100 recipes from her culture. We’re just getting started! 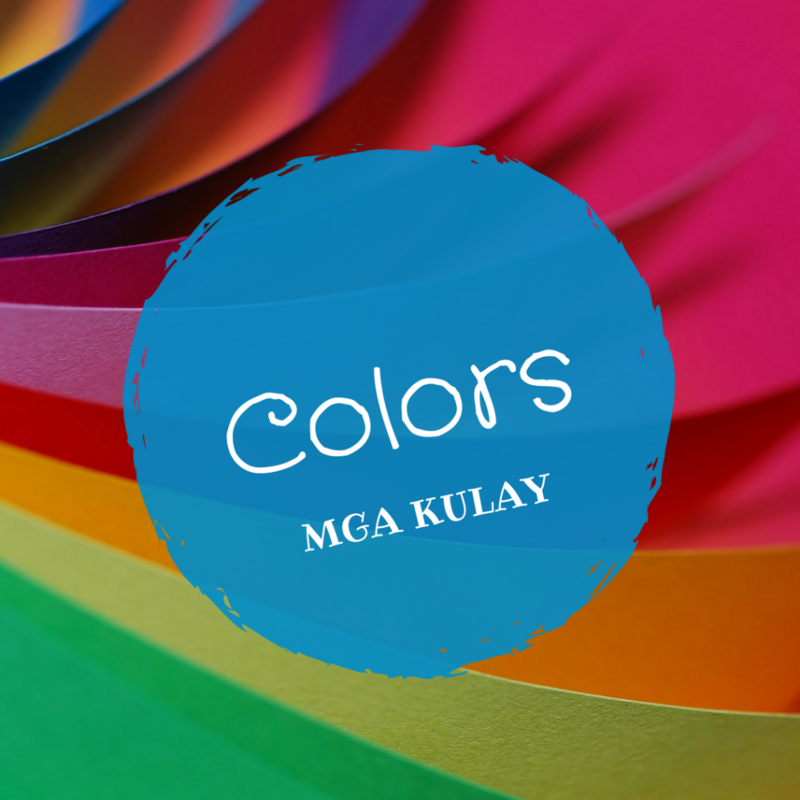 So stay tuned because we will continue to post resources, activities, and books to delve in Filipino culture, to commemorate our heritage month. Check back throughout the month for more cultural goodies. 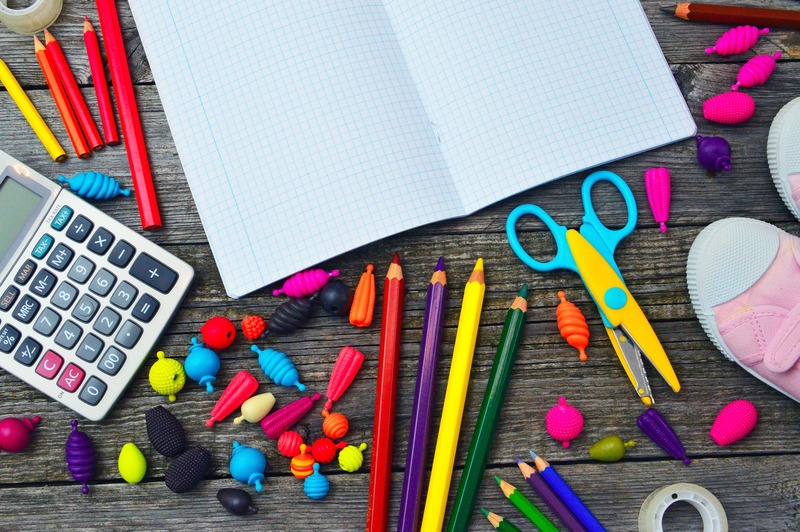 If you know of any resources that you’d love to share, feel free to comment below and we can add them to our list. 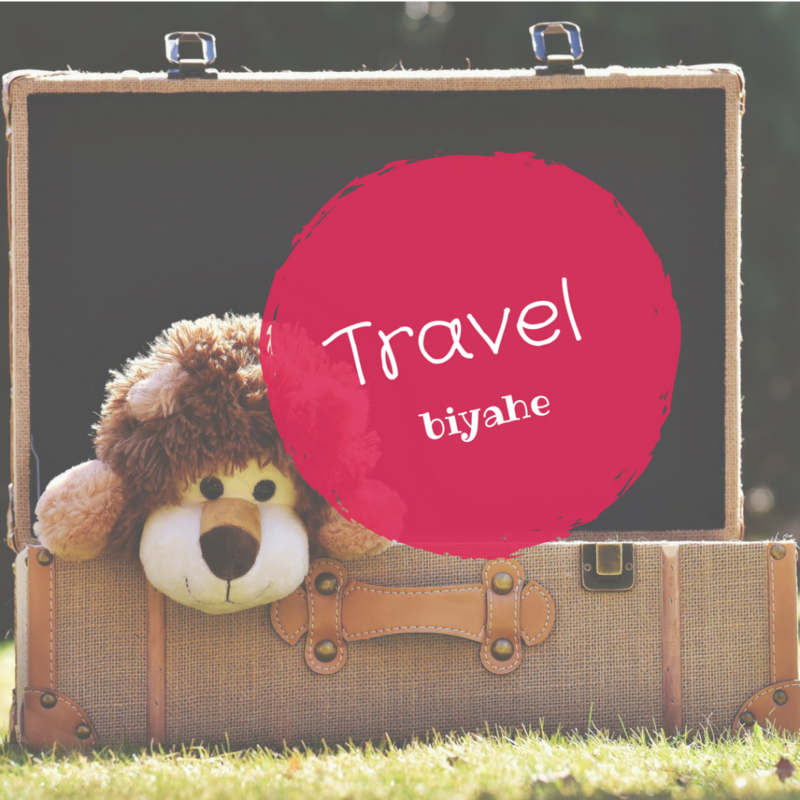 You are also welcome to sign up to be a part of our Tagalog Tuesday Tribe so you don’t miss any updates. 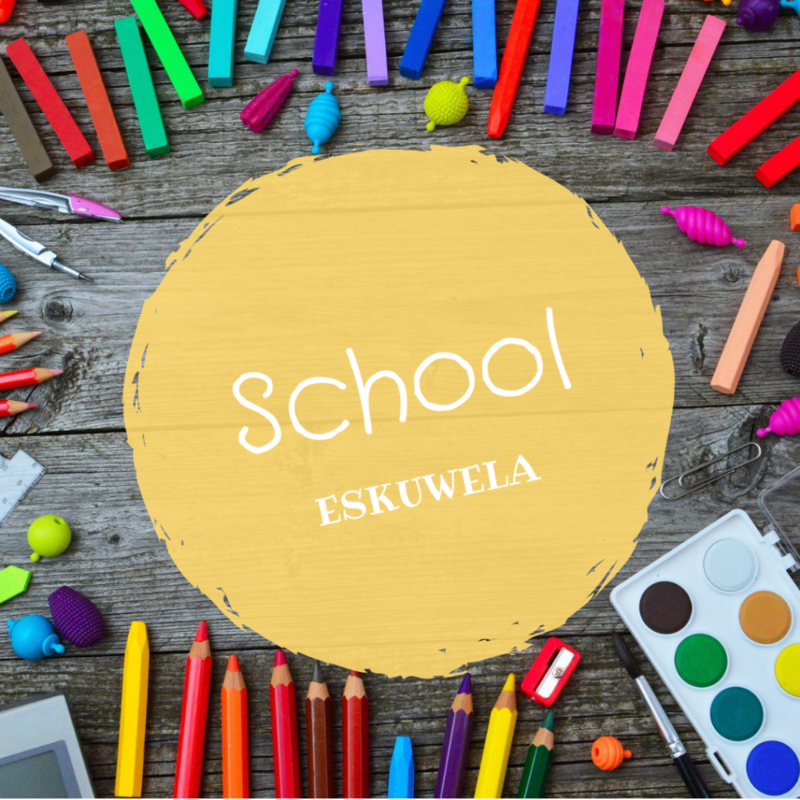 It’s Back to School season! 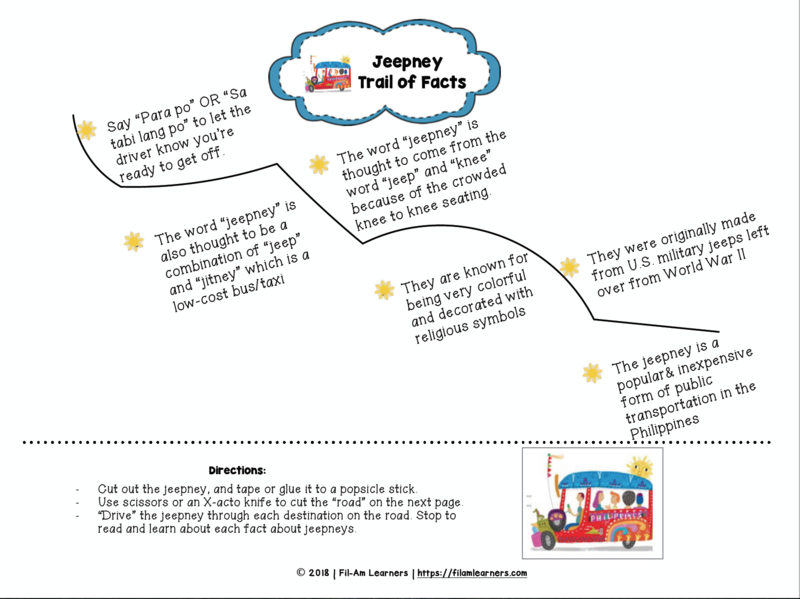 We are starting a unit to learn about school-themed vocabulary words to kick off our season returning to school. 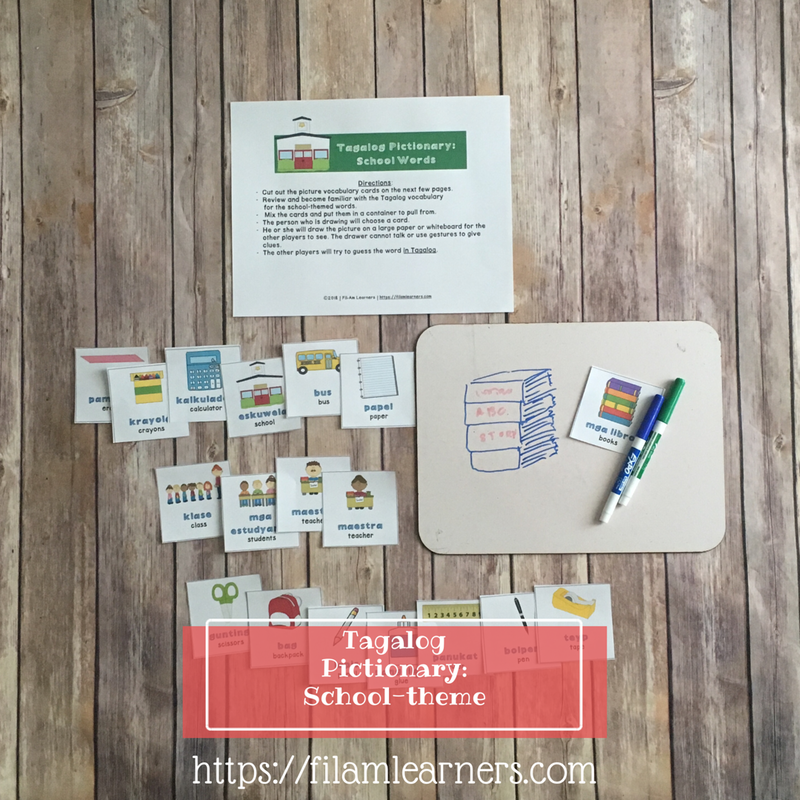 Our first activity for this unit is School Pictionary in Tagalog/English. 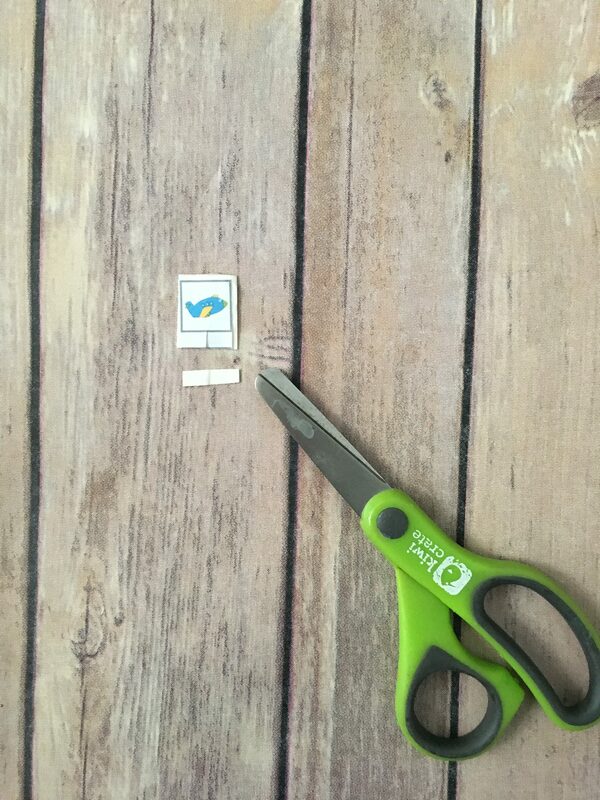 It includes 18 pictured vocabulary cards to cut out. 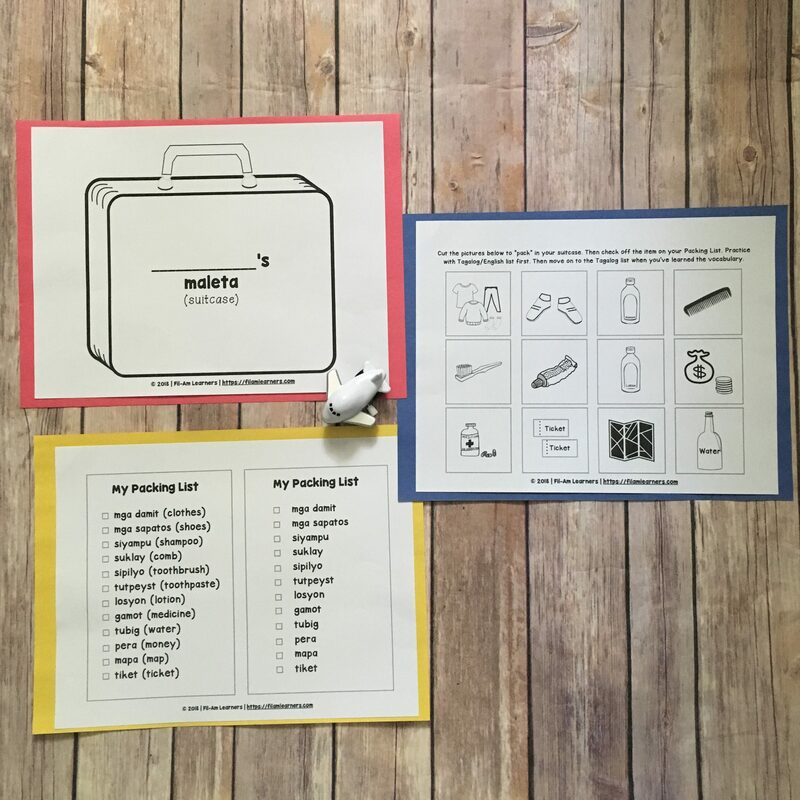 They can be used as flash cards to learn and review the words first. 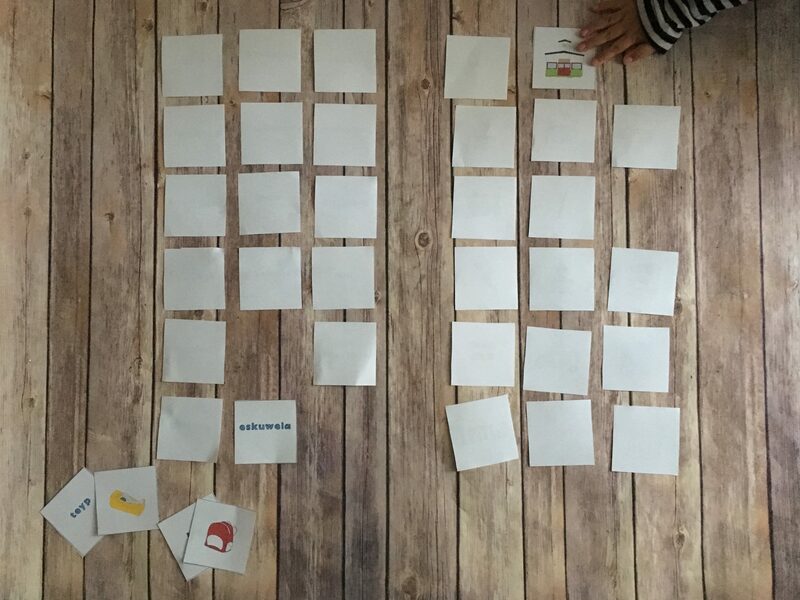 Then the cards can be used in an exciting game of Tagalog Pictionary. 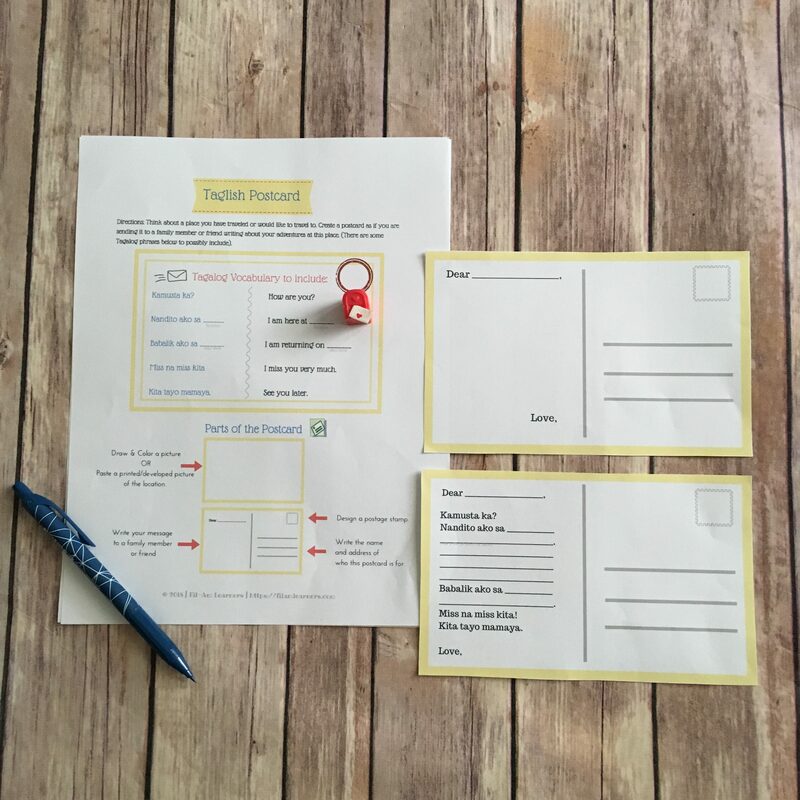 First, access the printable cards here to download and print. 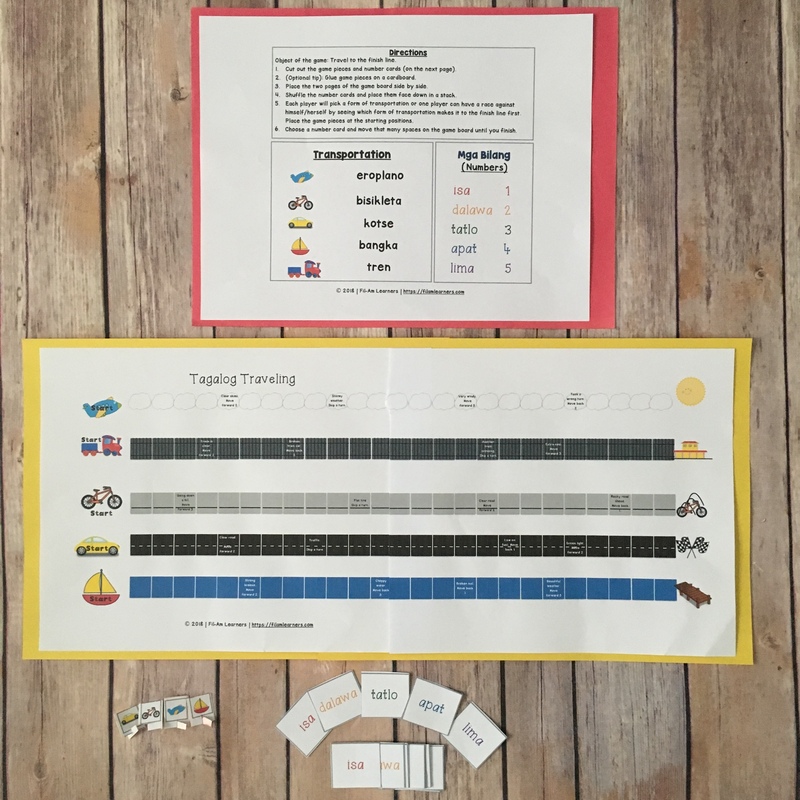 Cut out the vocabulary cards. 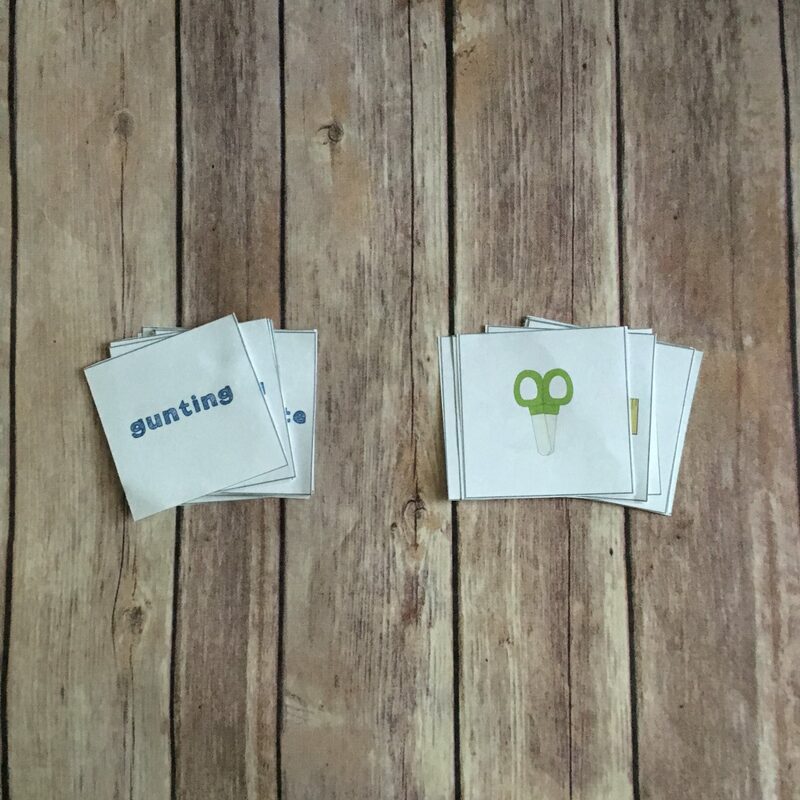 Place the cards in a container in which the other player(s) cannot see the card you are pulling. 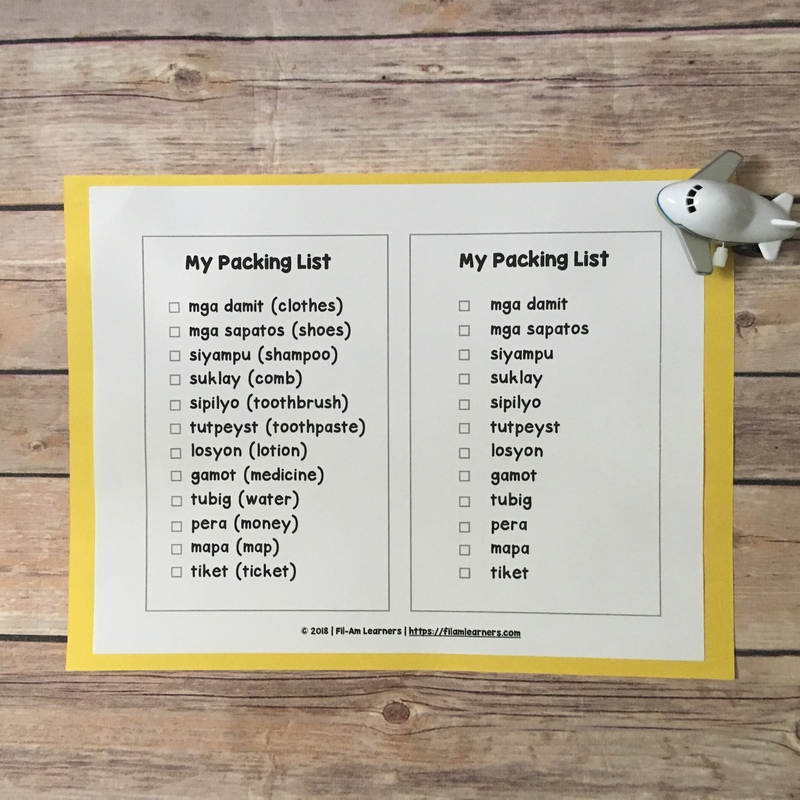 Have a large poster paper or whiteboard such as this one. 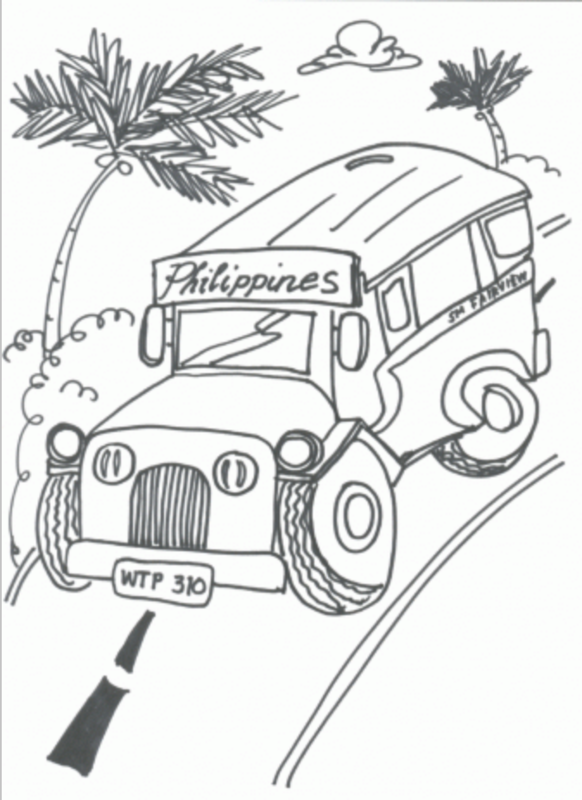 Players can take turns being the one drawing the image, while the other player or players try to guess the word using the Tagalog vocabulary for it. 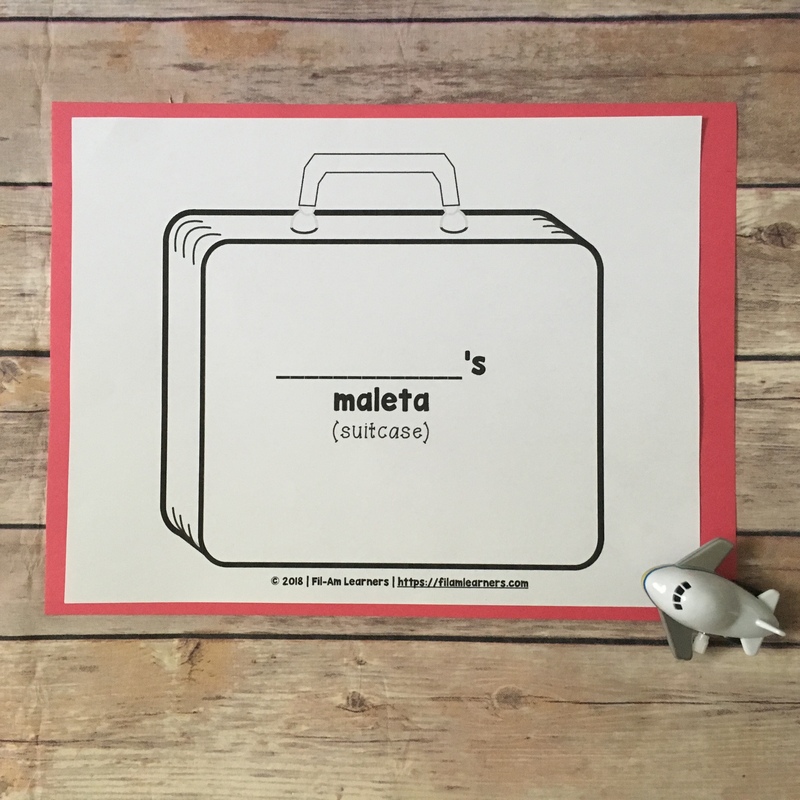 Ready for a fun game of Tagalog Pictionary? 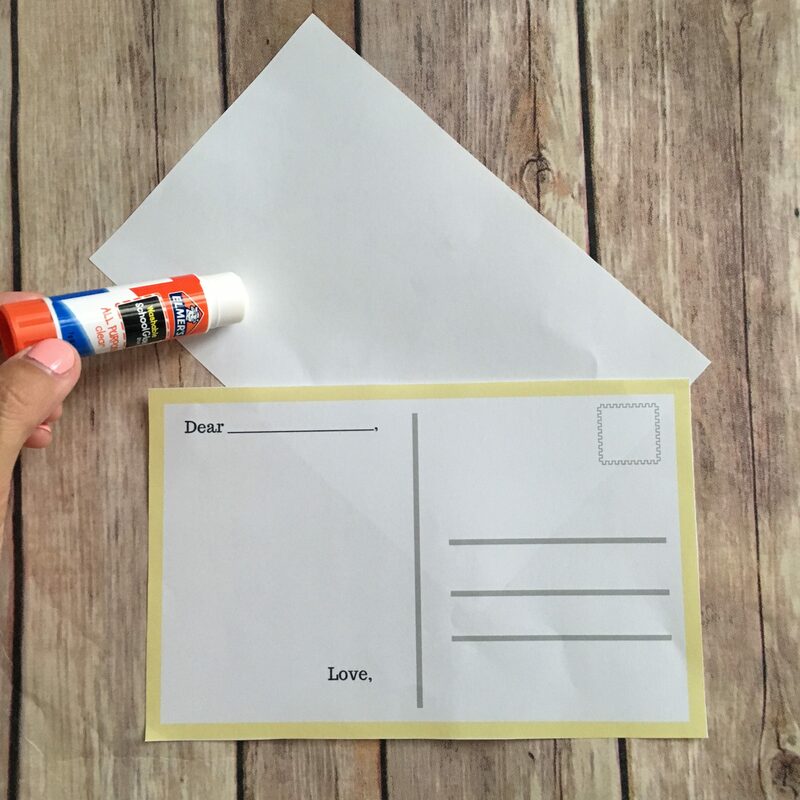 Head over here to access your printable. 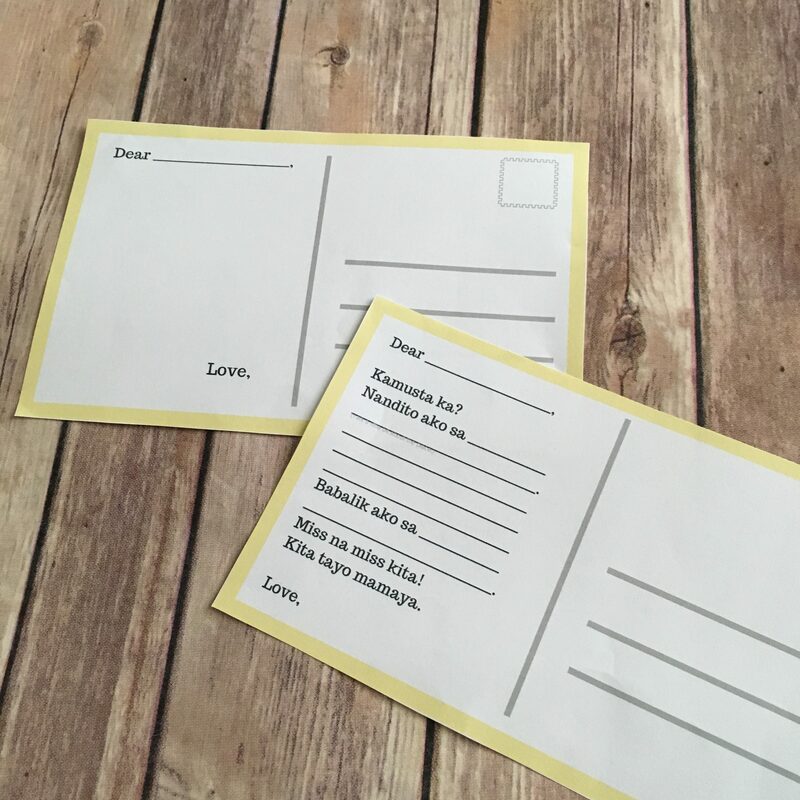 Using the same vocabulary words from activity 1 (Tagalog Pictionary), we have created cards to play Memory or a matching game. 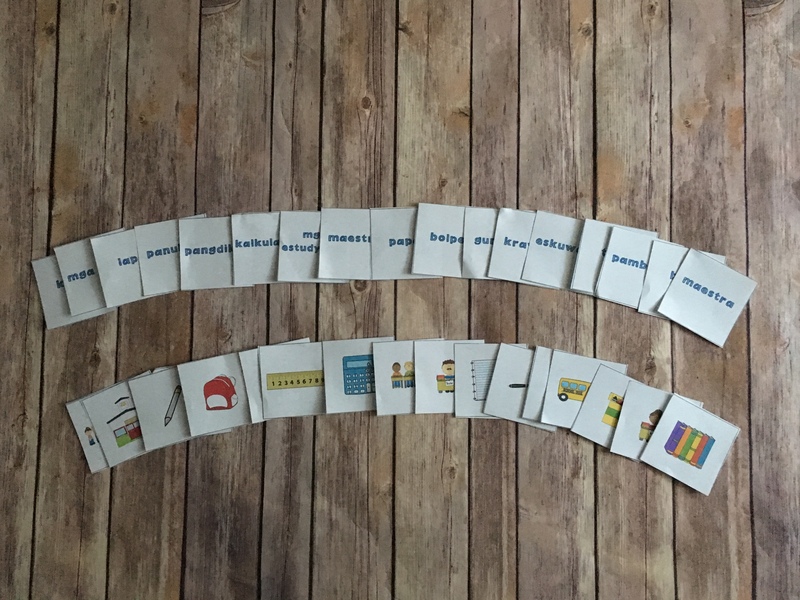 There is one set of picture cards and another set of just the Tagalog word for the picture. 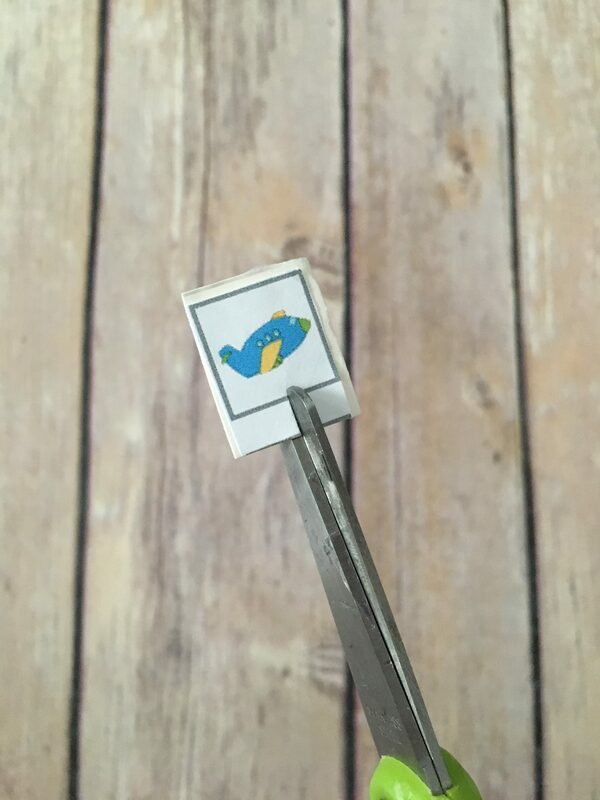 Flip the cards over face down on a flat surface. 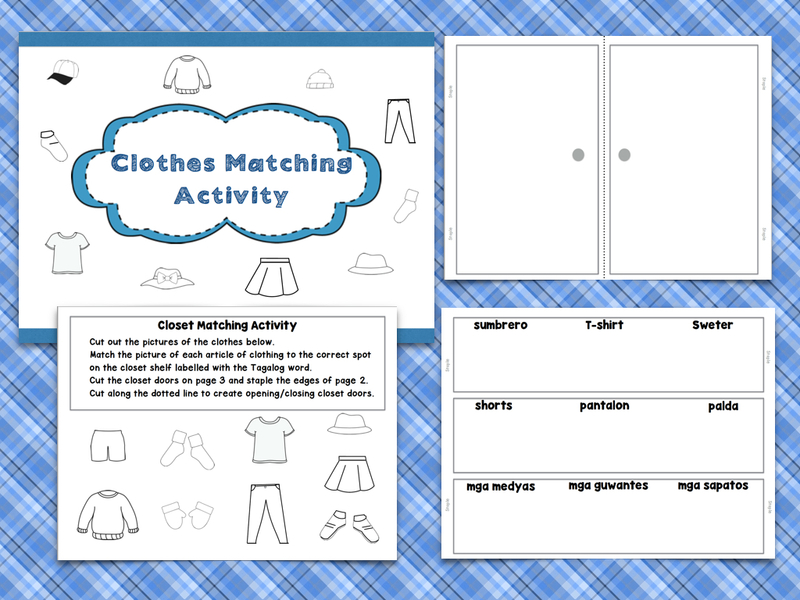 Then choose a card from the picture pile and a card from the vocabulary word pile to see if you can make a match. If you make a match, you can have another turn. If not, it will be someone else’s turn (If you are playing with other players). 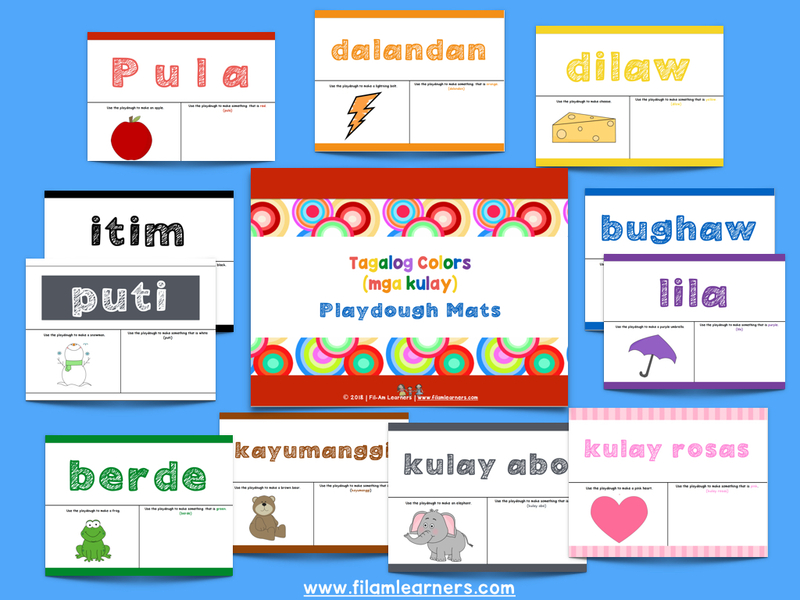 It is a great test of memory and also a way to review Tagalog vocabulary for school-themed words. 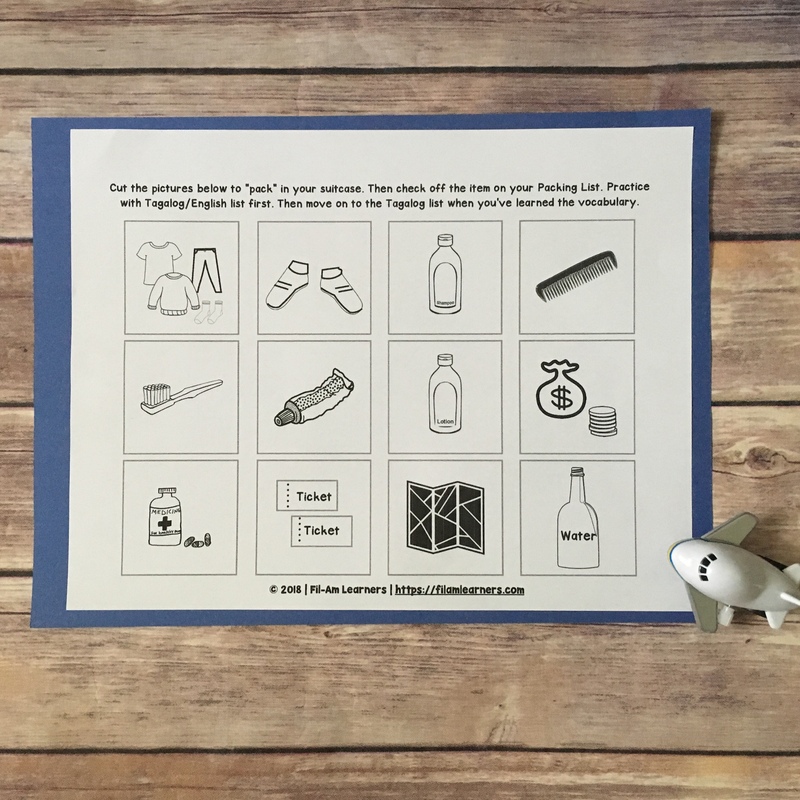 Click here to access this printable! This week we are focusing on ourselves. 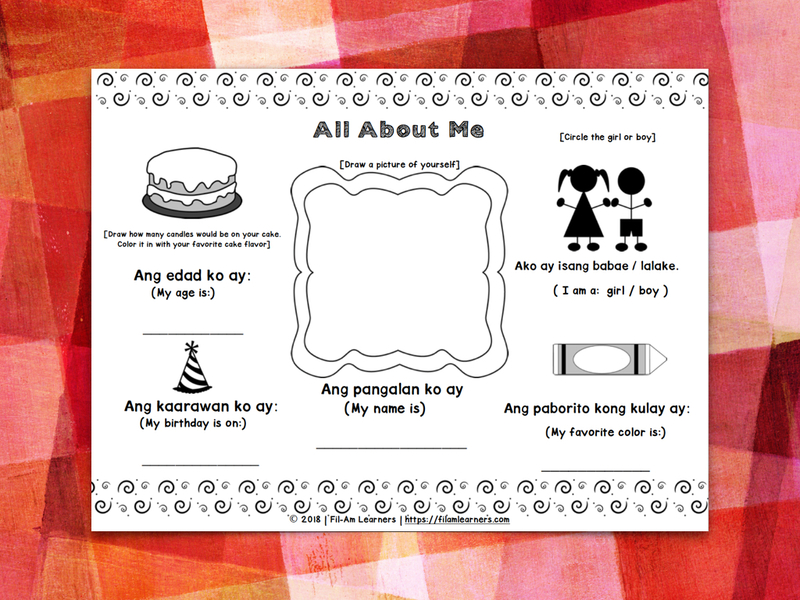 The activities will teach how to introduce yourself, including your name, your gender, your birthday, age, and favorite color. 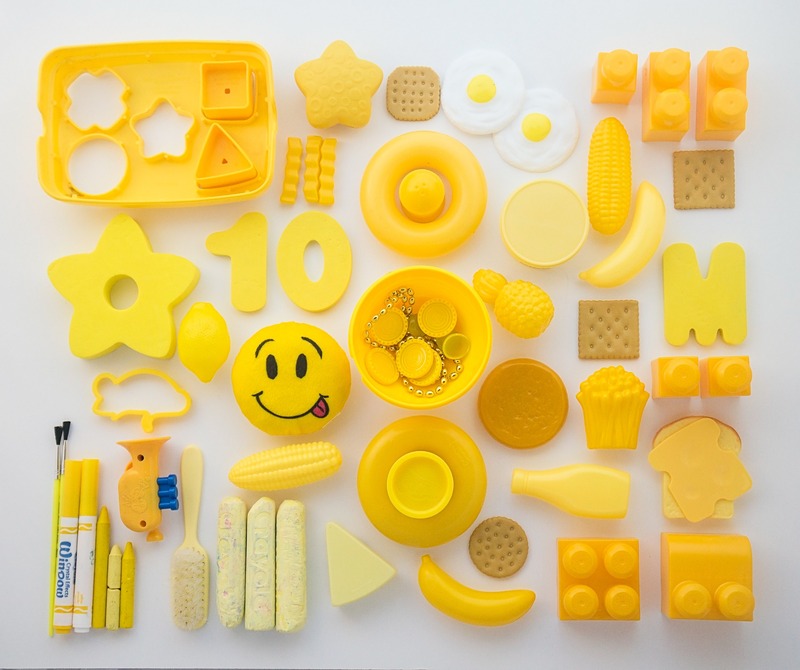 There are many more aspects to describing a person that we will cover in future activities. So stay tuned. 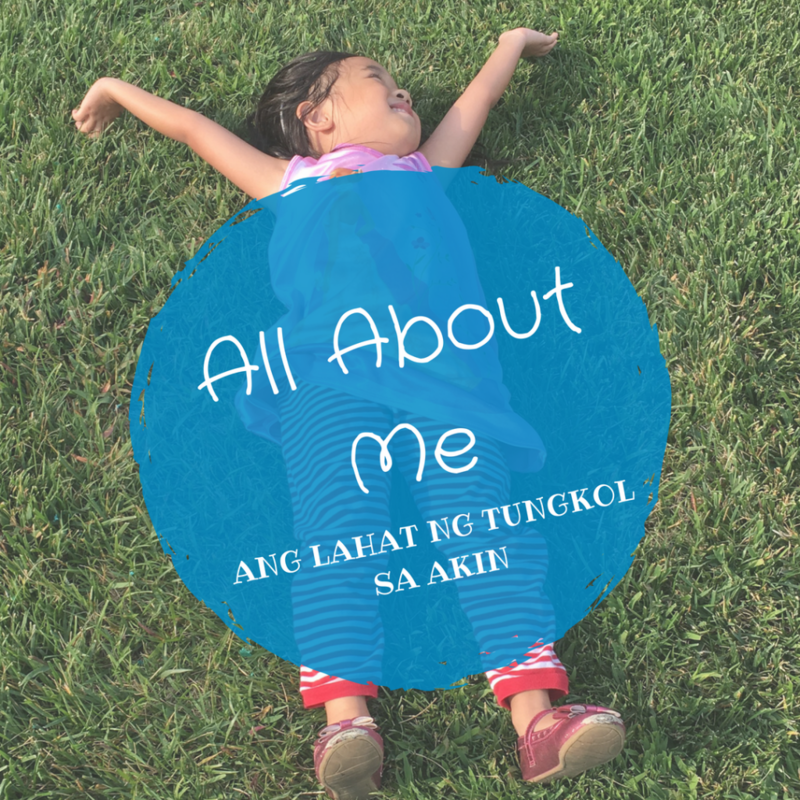 In the meantime, get access to the All About Me poster here. 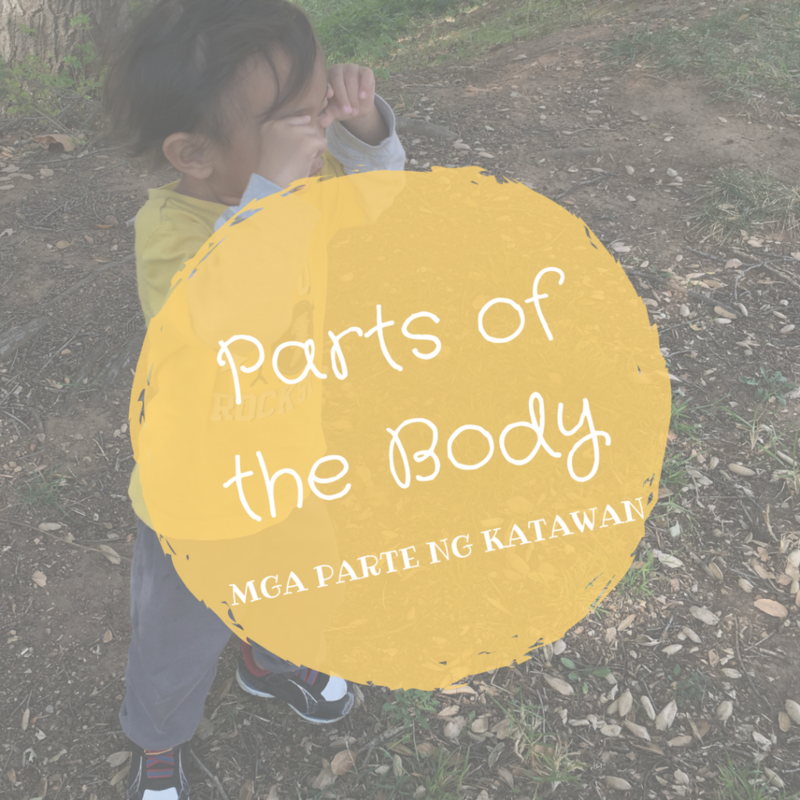 We will be learning about the parts of the body in Tagalog for the next couple of weeks. Here is a modified “Head, Shoulders, Knees, and Toes” to kick off this unit. Watch, learn, and sing along with us! Here is a video (from Robie317) of “Sampung mga daliri” to watch while following along with the lyrics. 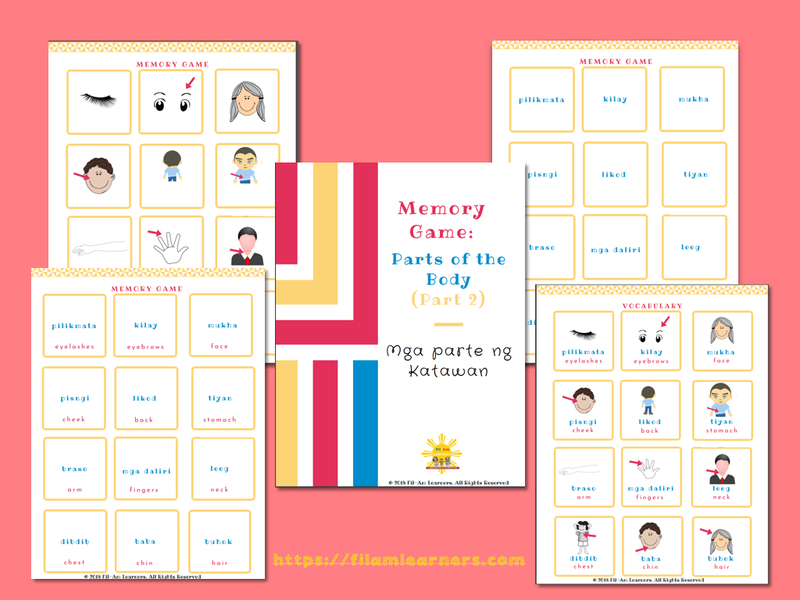 Here is a Memory Game with additional body parts not included in Part 1. 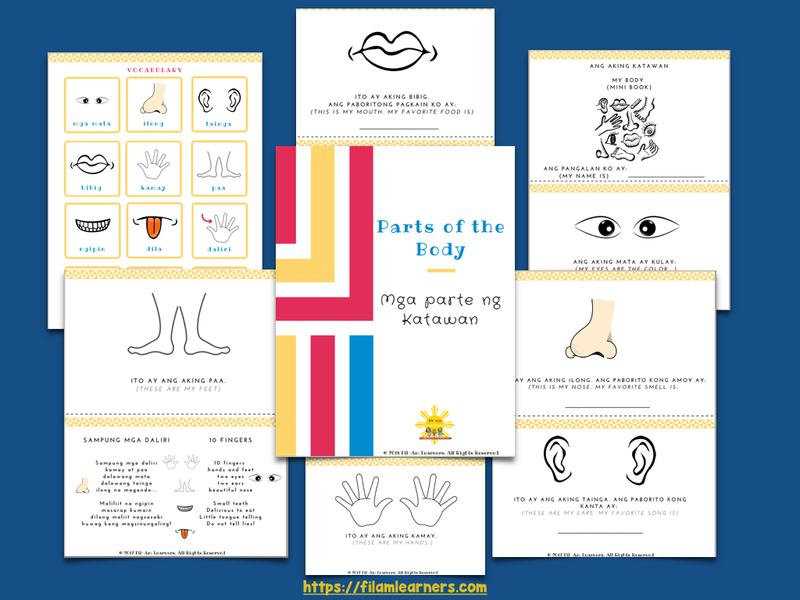 It comes with picture flashcards and 3 sets of cards to play memory while practicing the body parts in Tagalog and English. 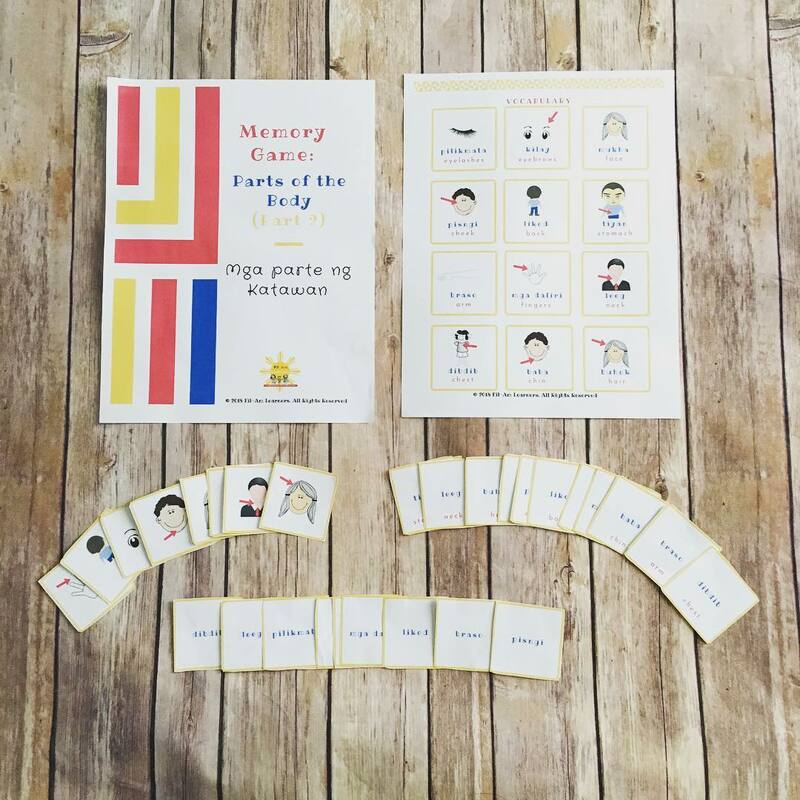 Go here to access the Body Parts Memory Game. 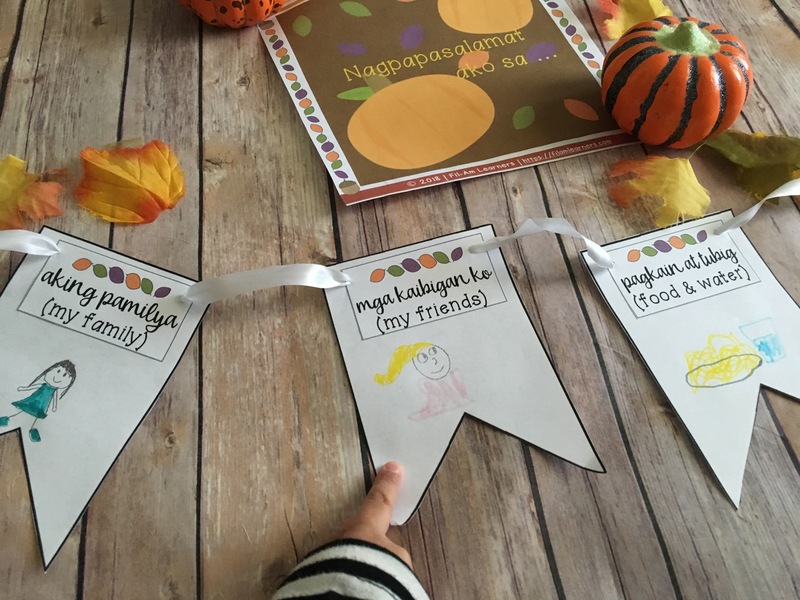 Trace an outline of your child’s body on a large butcher paper or using chalk outside on the pavement. Then have them label the body parts in Tagalog. 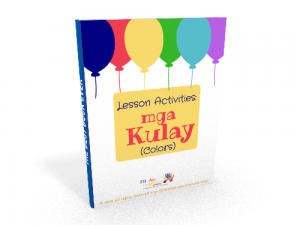 Accompany this unit with the “Mga Bahagi ng Katawan” booklet from DinoLingo Tagalog. (DinoLingo provides language lesson resources with books, vocabulary cards, CD’s, DVD’s in various foreign languages). 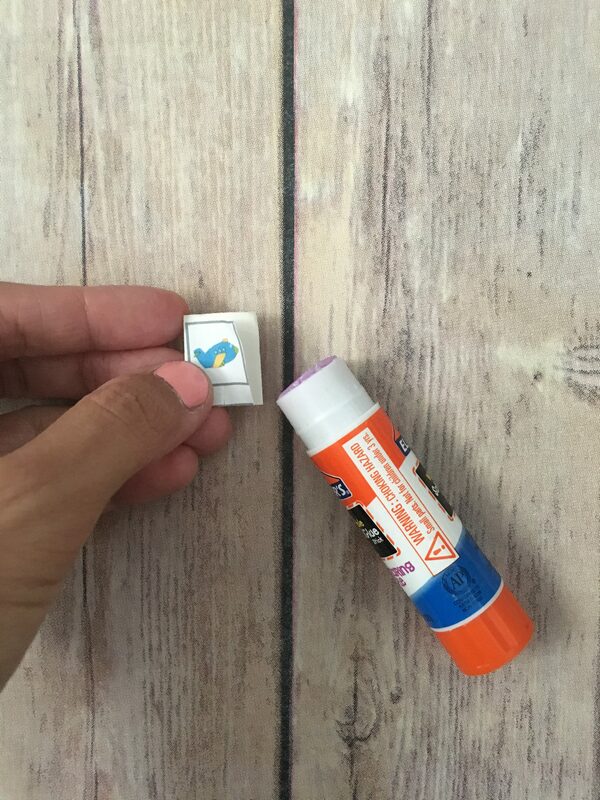 You can purchase single units on Amazon or head to the DinoLingo website for packages. 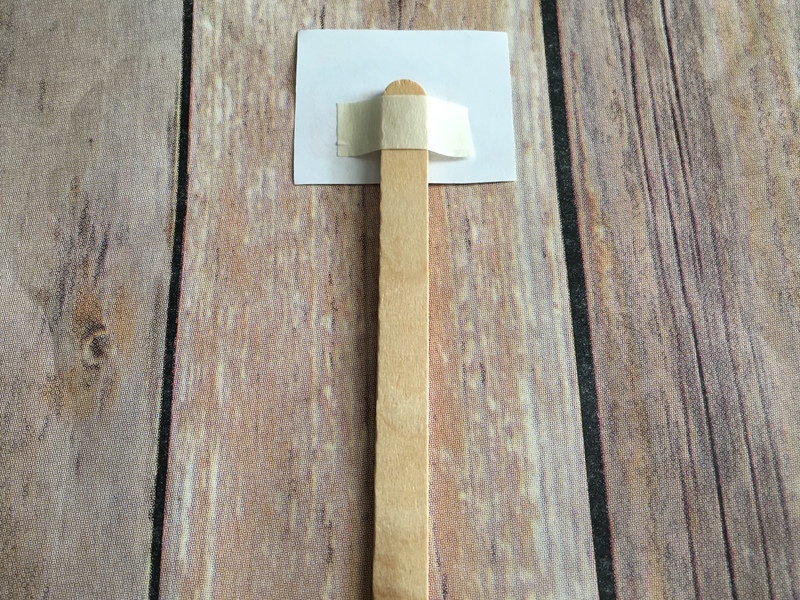 There will be another unit to come about additional parts of the body and more activities, so stay tuned …. 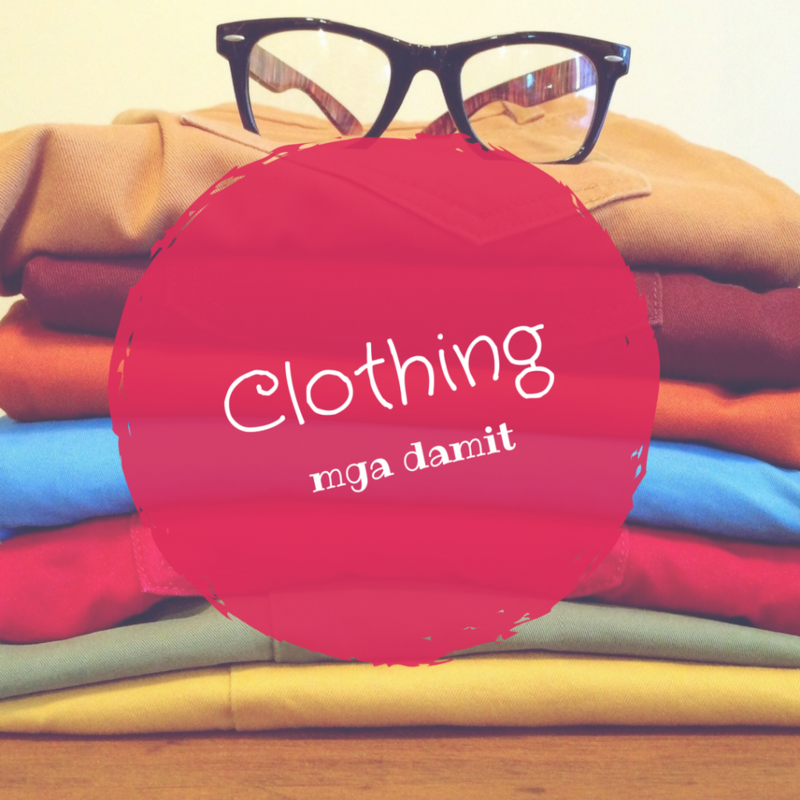 When doing laundry, practice naming the articles of clothing in Tagalog. 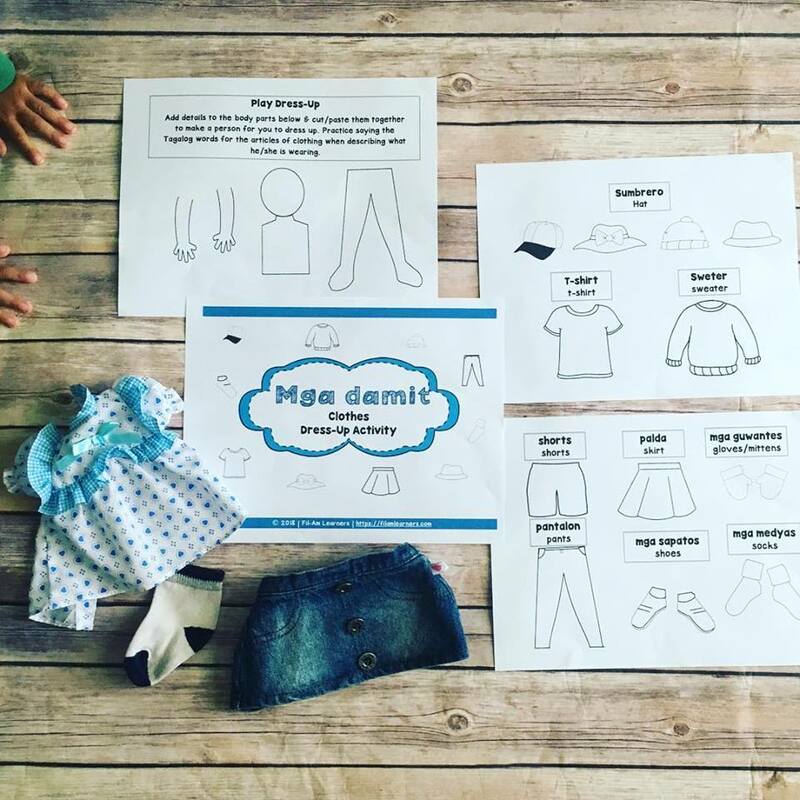 When selecting an outfit for the day, ask your child to list the clothes he/she will wear in Tagalog.